Looking back on the past few months it seems that I have done one of the more detailed and best documented searches for aphids which has been done in this area. 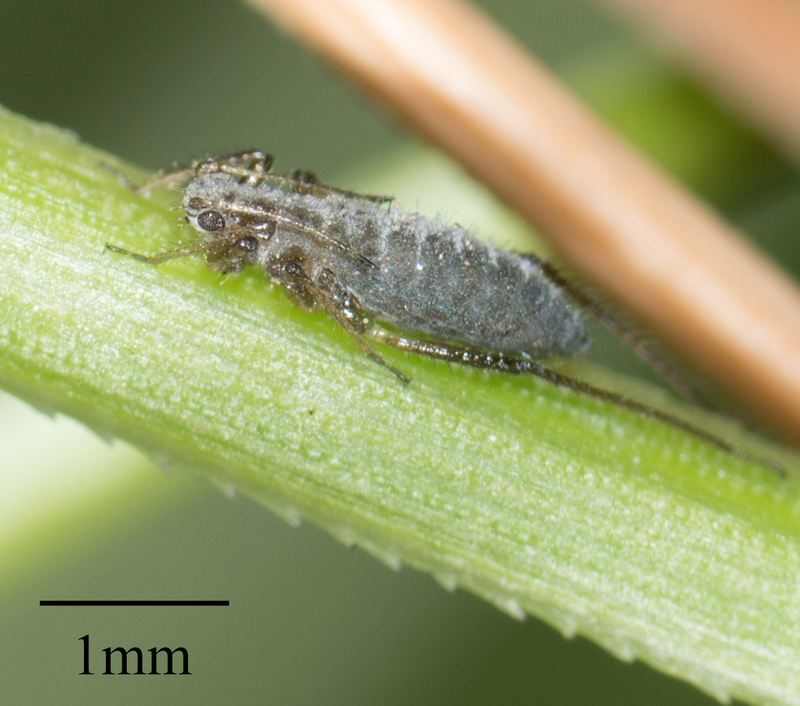 It is nothing compared to Aphid Trek's 9,000 slide collection, but the more than fifty species I have found included species apparently never photographed, species apparently unreported in California, and even some which are almost certainly undescribed species. 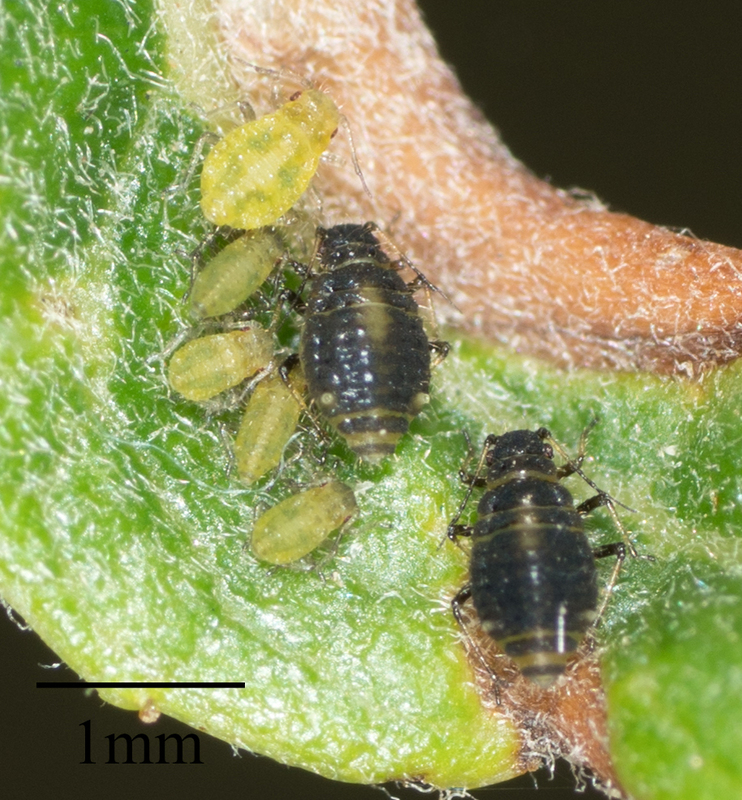 After getting through so many, I thought it was time to put together one location where I can quickly reference all the aphids I have found in Southern California. I will add on to as I continue to find more. This should be able to serve as a quick reference for anyone trying to identify an aphid they found or looking to find more species. 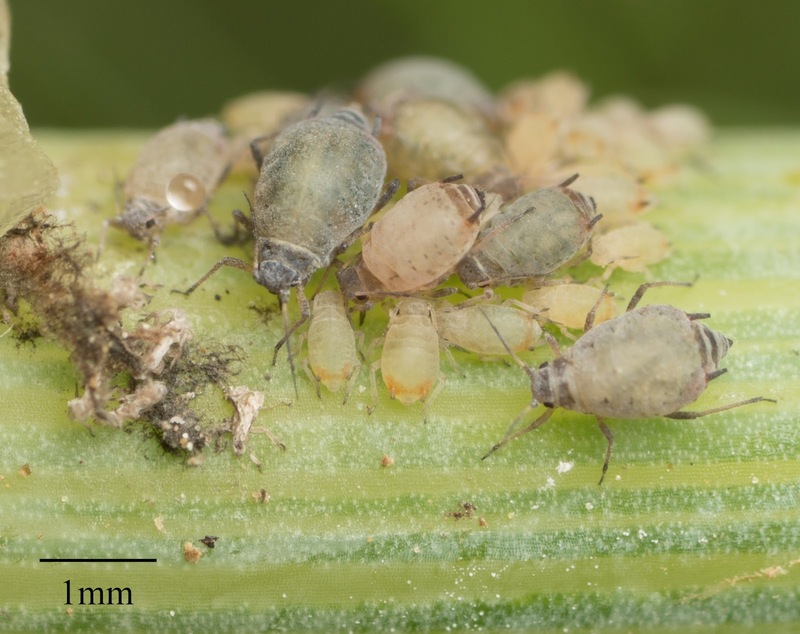 Given the complexity of aphids I probably have a few incorrect identifications. Most have been confirmed by someone who knows more about aphids than I, but a few I have stubbornly held on to an identification which is not as certain as it should be. A common aphid on legumes. 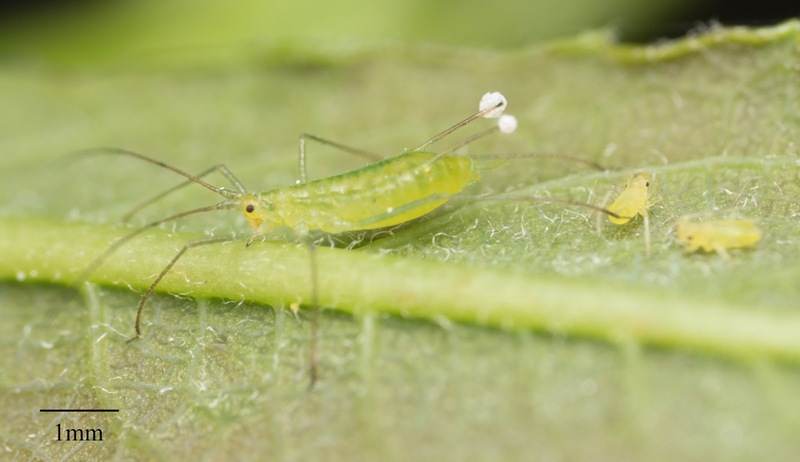 It can be separated from pea aphids by inspecting the antenna. The blue alfalfa antenna gradually darken to brown. 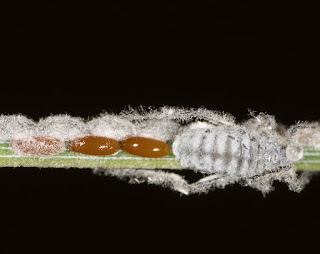 This is one of the most common aphids in California. However it is surprisingly difficult to find. 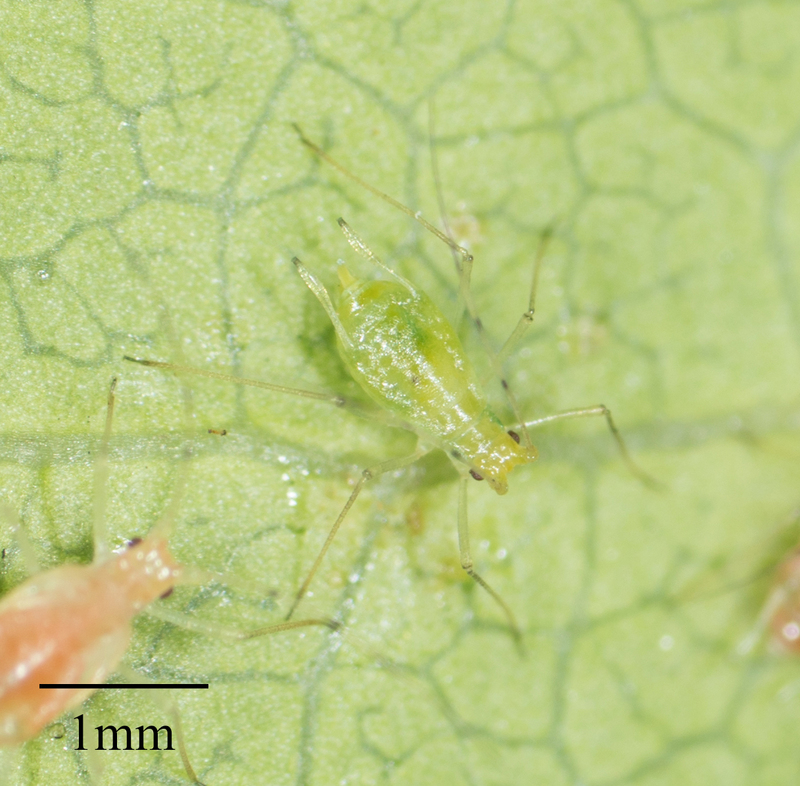 When I first found it I had to stare at prickly lettuce plants for a good five minutes before I saw it. However once you start to watch for it among the flowers you will almost always find it. 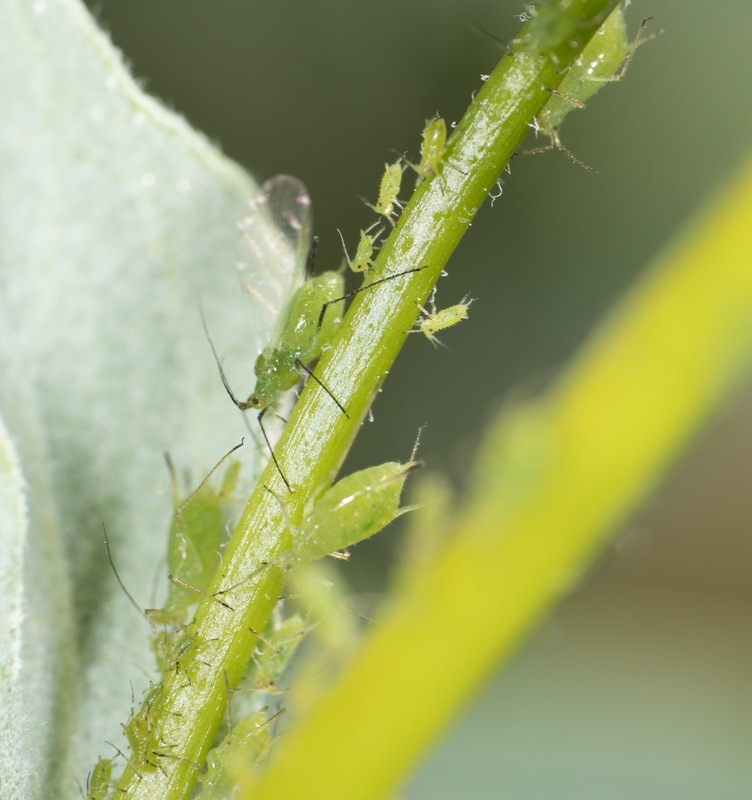 A difficult to identify aphid which I need to return to in an attempt to get a more certain ID. Due to the small number of species of aphids recorded on Ceanothus this seems to be an easily identified species for an Aphis. 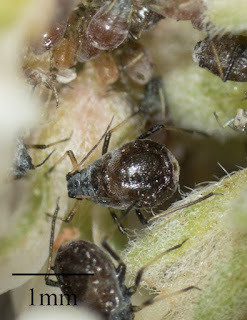 These aphids have distinctive antenna which are light at the base then dark, they also have a light head. 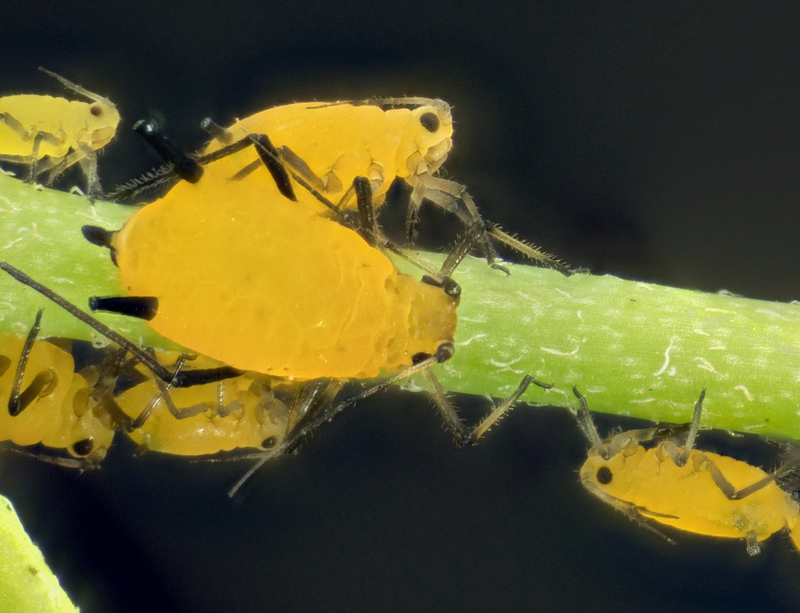 A very common aphid on a wide variety of hosts. 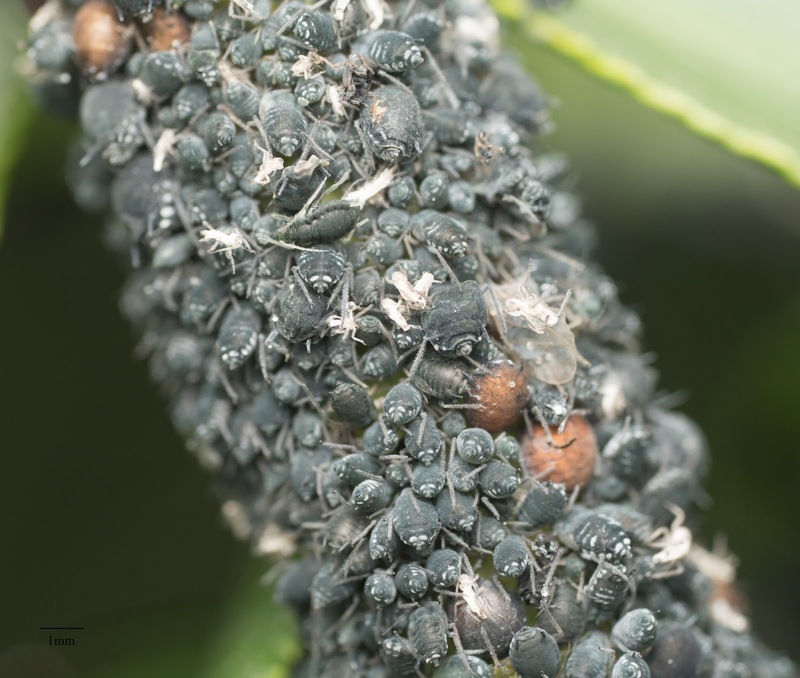 Unfortunately not very easily identified from photos due to the large number of black Aphis members. Very difficult to identify. 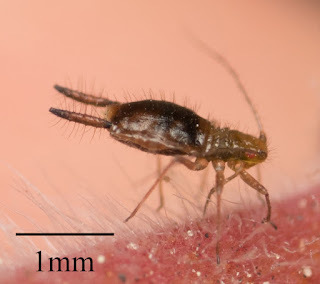 I have never found one which is a solid ID for this species. 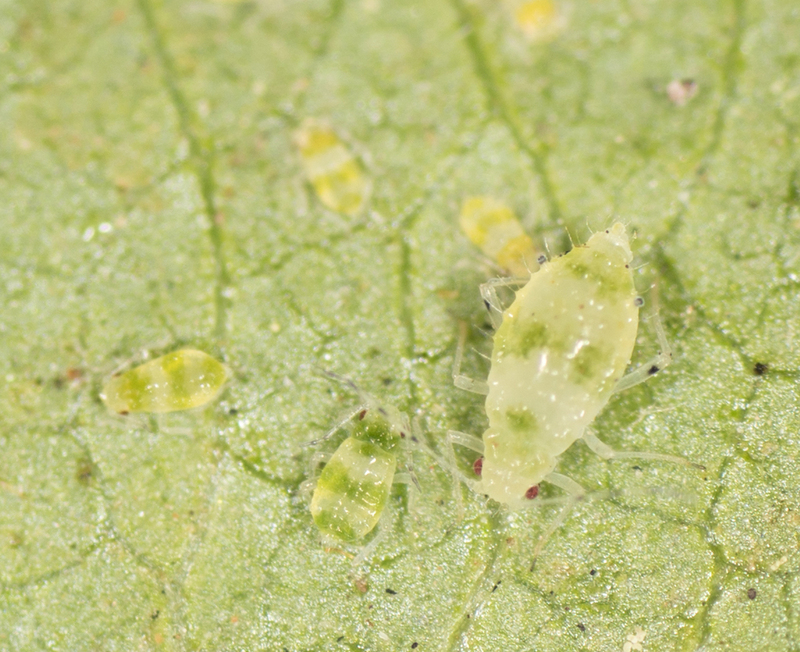 However I included it since I found some aphids which are probably this species. 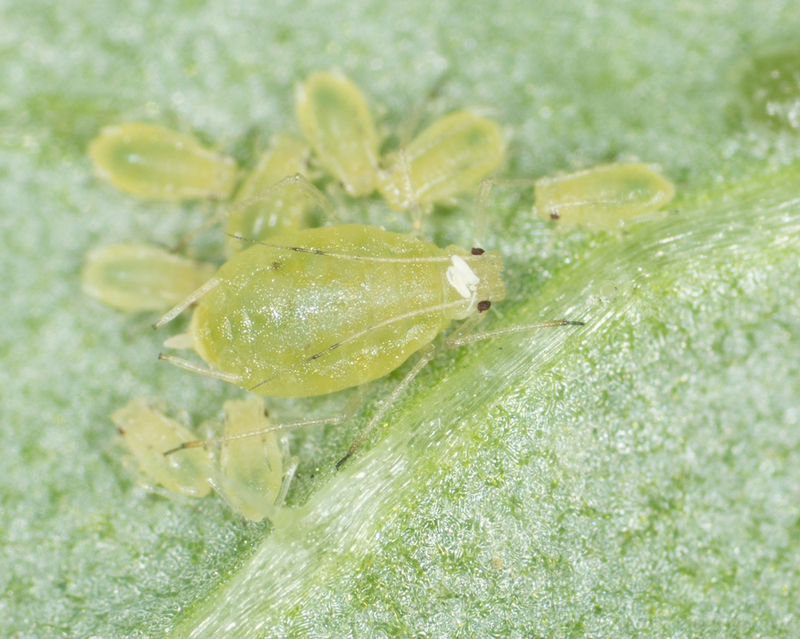 Hosts: The aphids I believe are this species were on nightshade and dock (Rumex) plants. 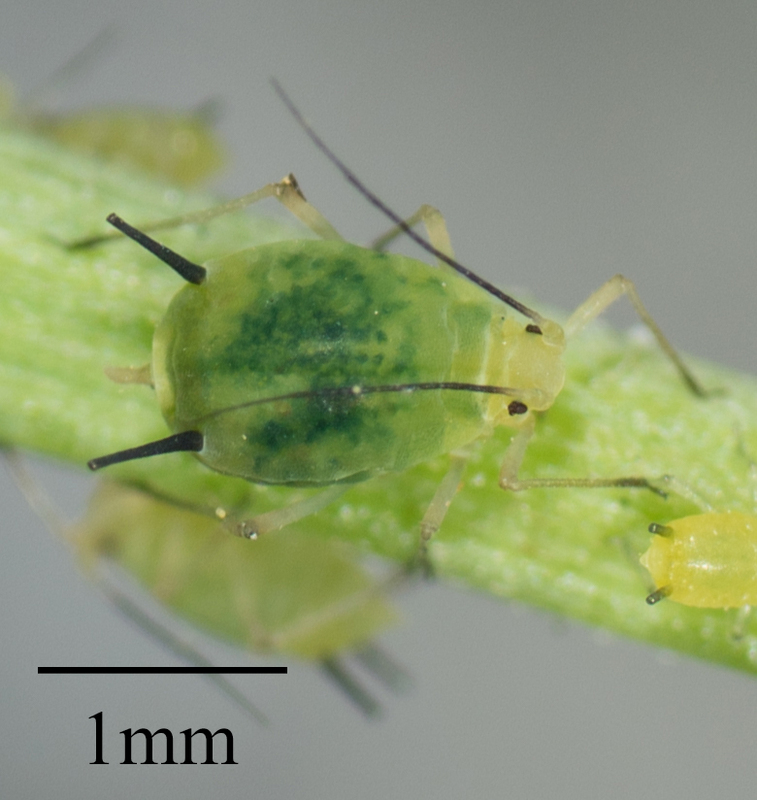 A rather generic looking green Aphis. 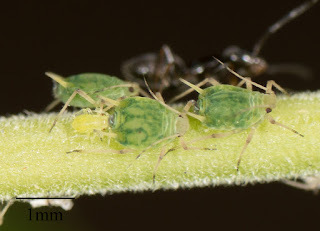 On willows there are apparently not many similar aphids though making it reasonably easy to identify. 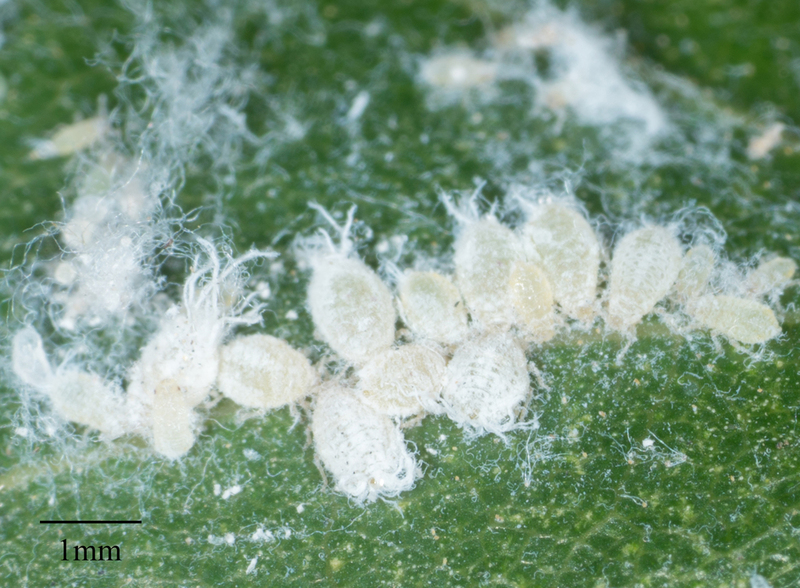 One of the most common aphids in Southern California but not particularly easy to identify due to the number of similar Aphis species. 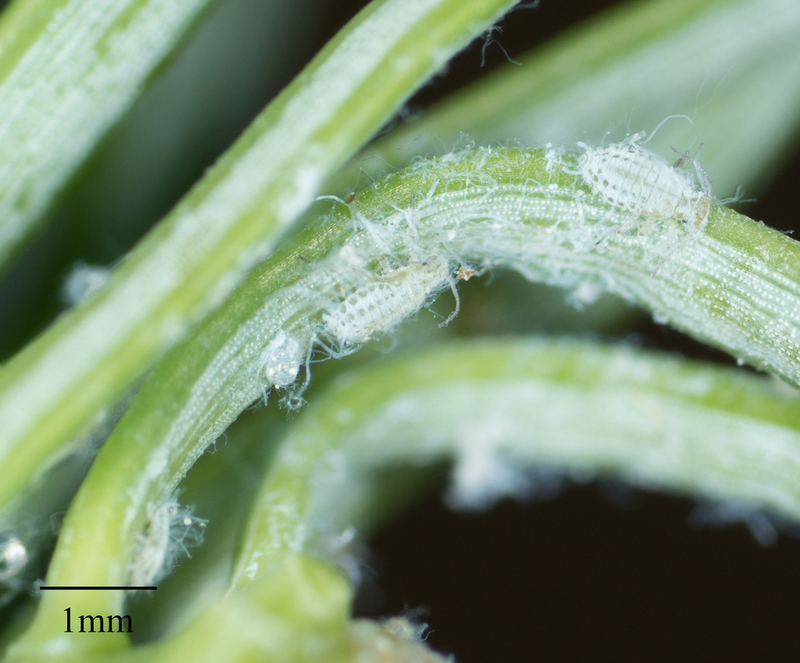 Hosts: I found it on Spanish broom(Spartium junceum). 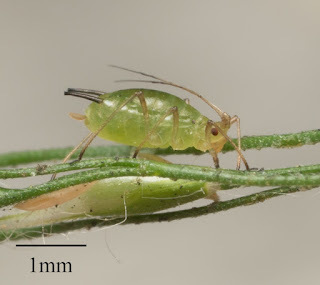 Yet another generic green aphid. The siphinculi is significantly lighter than melon aphids or spirea aphids. Hosts: Primroses, thus far I have only found on Oenothera elata. 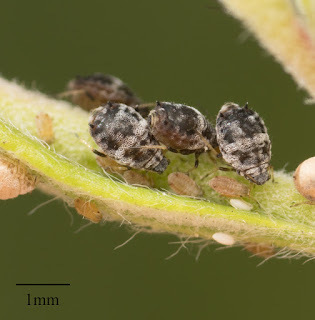 This is probably the most commonly found aphids in Southern California. 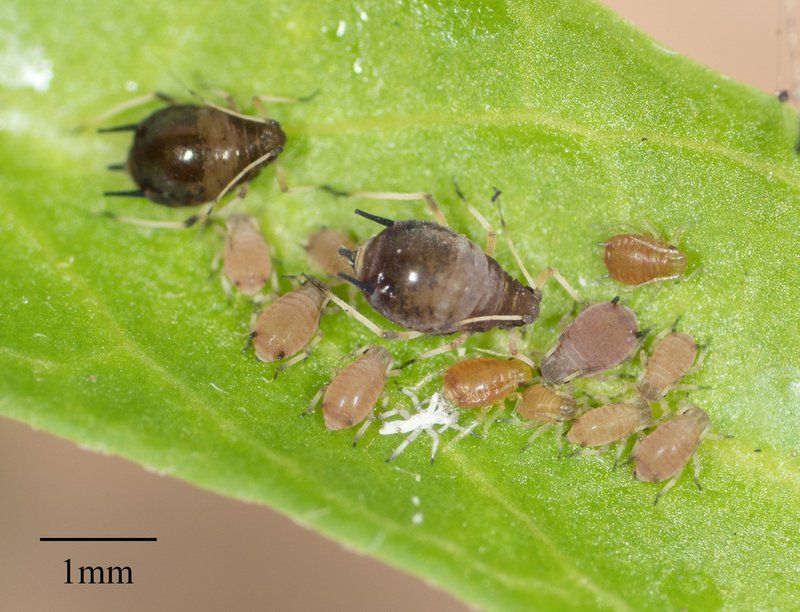 Find a milkweed plant, it almost certainly has loads of this aphid. 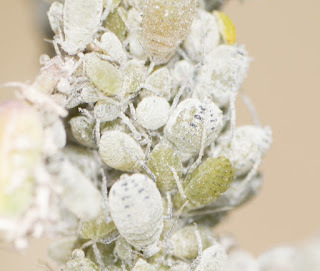 Hosts: I have found this only on Asclepias and Funastrum species although it can be found on a great many other plants. Not particularly common but unusually easily identified from photos due to the large dark patches. 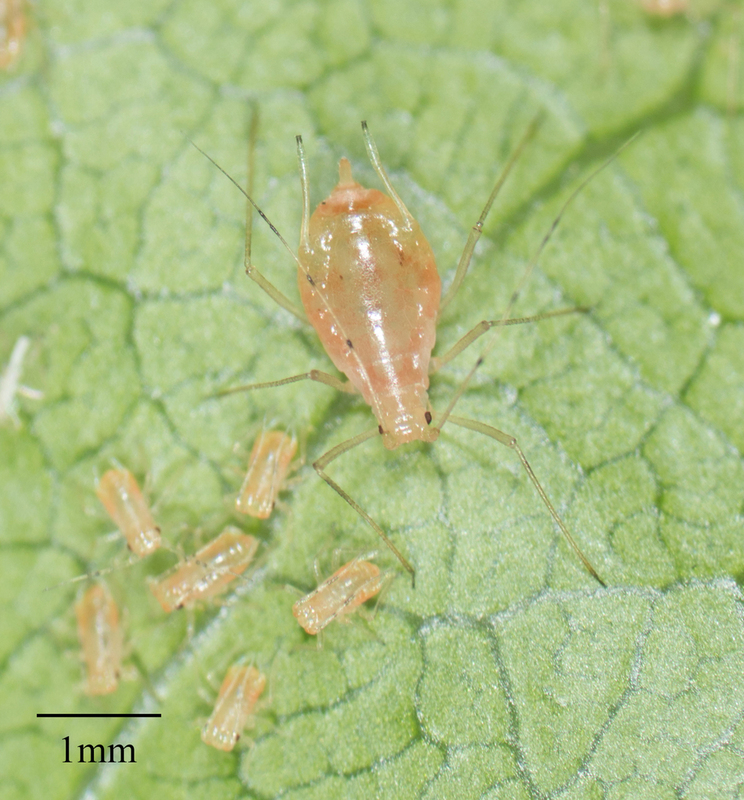 Yet another generic Aphis. These seem to be distinctive due to how closely they pack on the stems of elderberries. 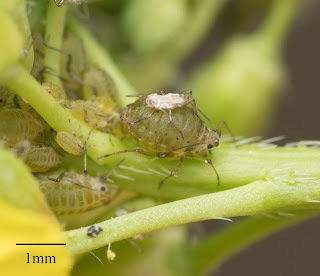 These are so close to melon aphids that I am not certain I found them. 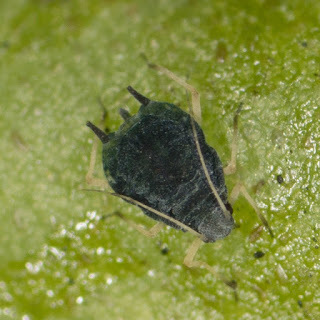 However I have found aphids on a member of the stonecrop which look like melon aphids but have a dark cauda. Hosts: I only identified the host plant to the stonecrop family. 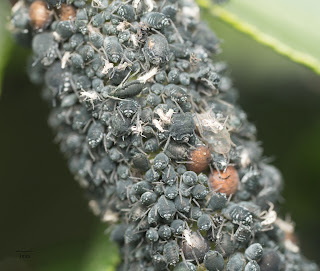 Hosts: Seems like they are found on just about anything. Among other plants I have seen them on indian hawthorn. citrus, and Bidens pilosa. An aphid I found on docks and was never able to find a plausible species level ID for. One of the more recognizable and common aphids. Hosts: Many species of thistle. I suspect that I have encountered this species much more as they just look to me like nymphs. 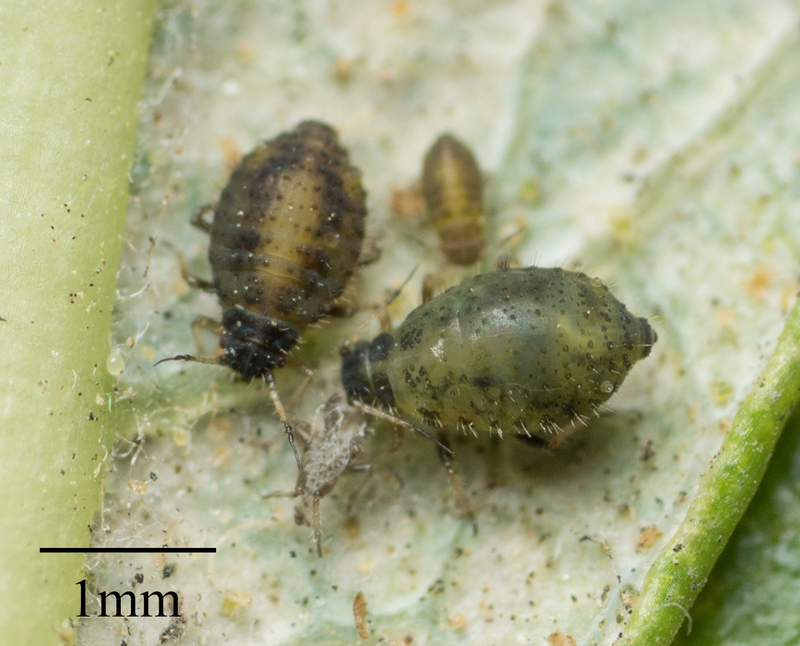 Since nymphs are not typically identifiable I likely passed these by. When I found them they were with two Aphis species so I simply did not realize that there was a third species there. 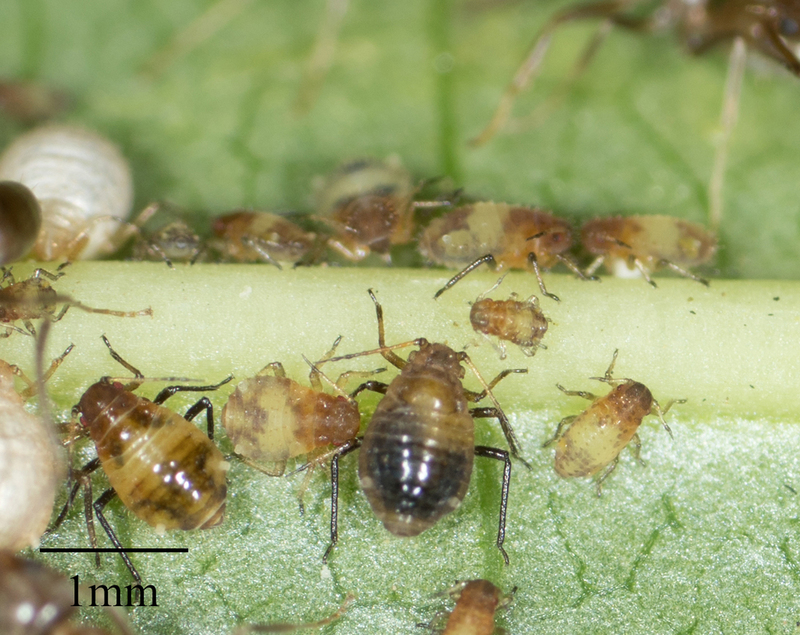 Hosts: I found them on sunflowers, but they are likely to be present on many other plants. I only found this species because I noticed some ants among the flowers of a buckwheat plant. They hid well enough that I have probably walked past a great many.The really short siphunculi should separate them from other species in the genus. 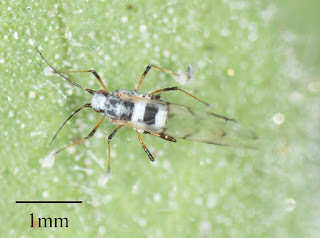 Another Braggia species which is easy to tell from Braggia deserticola due to the longer siphunculi and white patches. 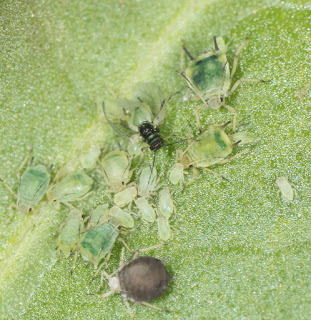 Cabbage aphids are one of the more reported aphids on iNaturalist due to how common and conspicuous they are. Host: Mustards including wild black mustard and cultivated mustards such as cabbage, kale, and broccoli . 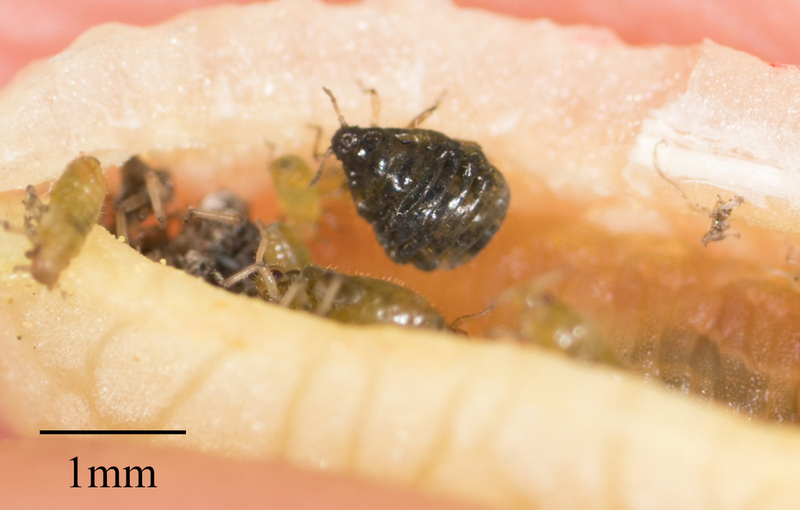 The first time I found it I threw away the photos because I thought it was a mummy. Further examination though showed them to be clearly living aphids. 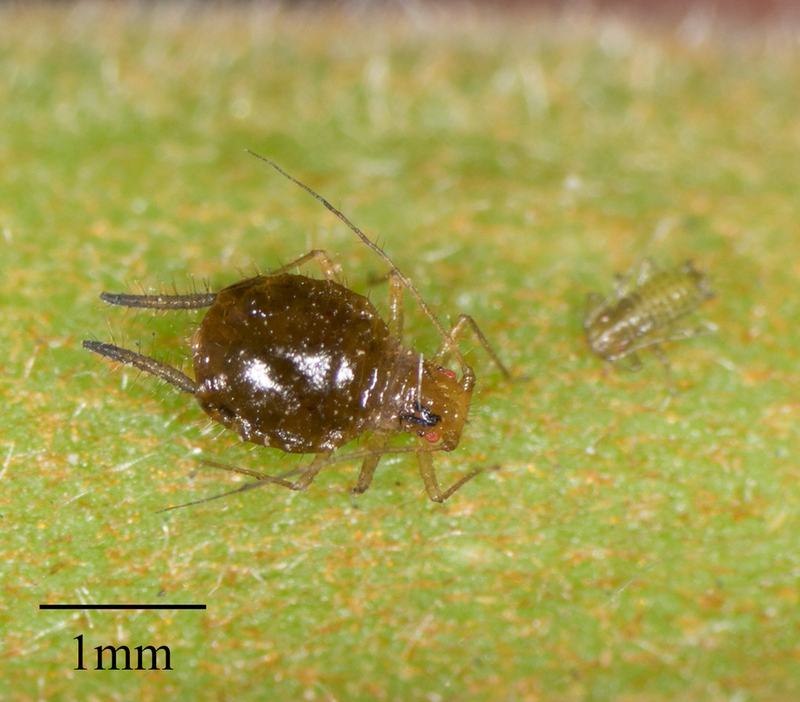 The species was previously only reported from Mexico and Brazil but the description seems to match C. setariae. Host: Grasses,most commonly hiding among the flowers of Polypogon monspeliensis. 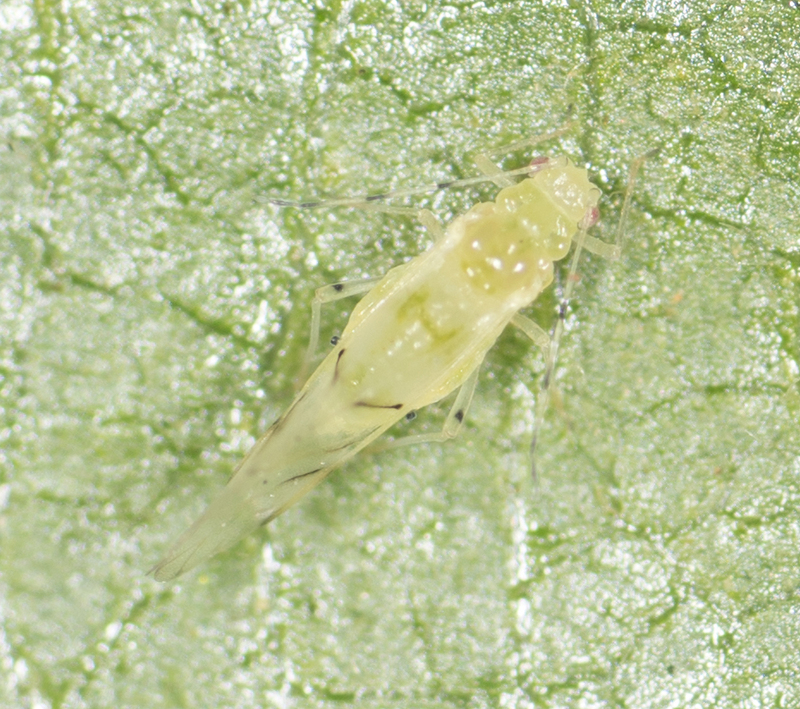 One of the most common aphids on Poplar trees. 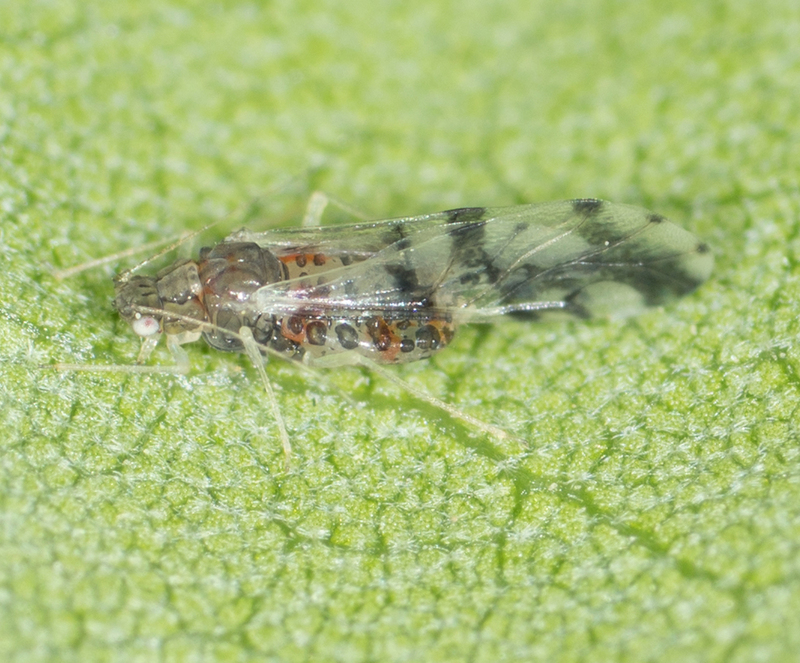 Easiest to identify from the winged alate form, but I never seem to find them. I found some aphids near Jenks Lake which don't seem to fit in any key. They must be an undescribed species. A batch of aphids I found in the Angeles National Forest but have not managed to identify to species. 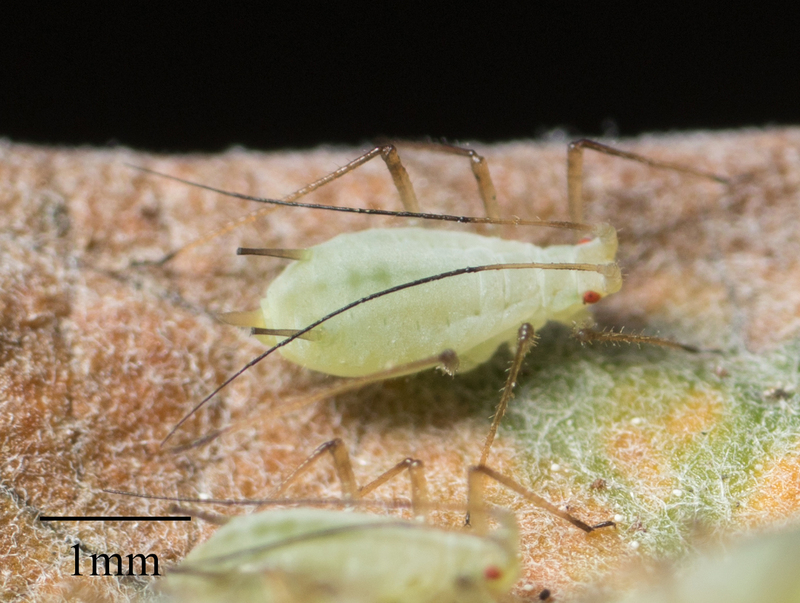 Another batch of aphids I found in the Angeles National Forest but have not managed to identify to species. 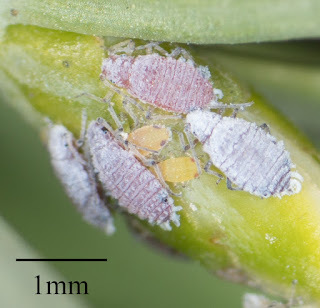 Some aphids I found in Diamond Bar but have not managed to identify to species. 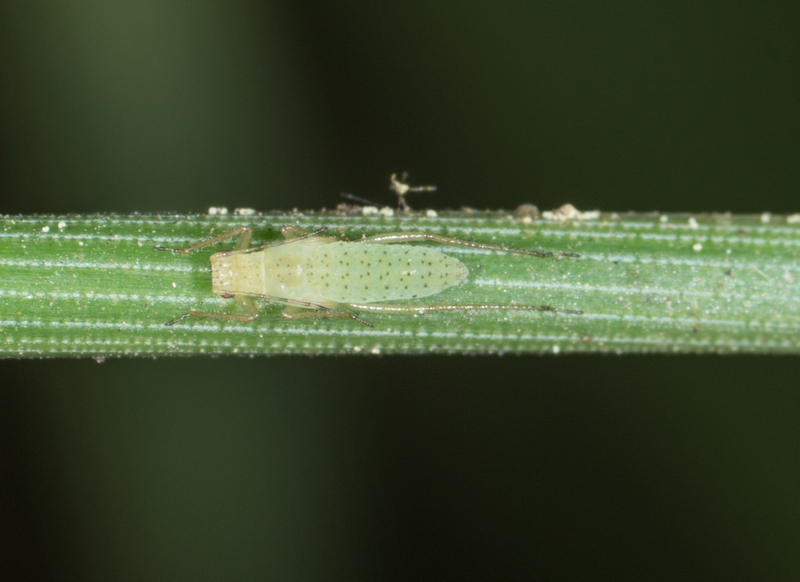 Russian Wheat aphids are easily identified by what looks like a second tail. 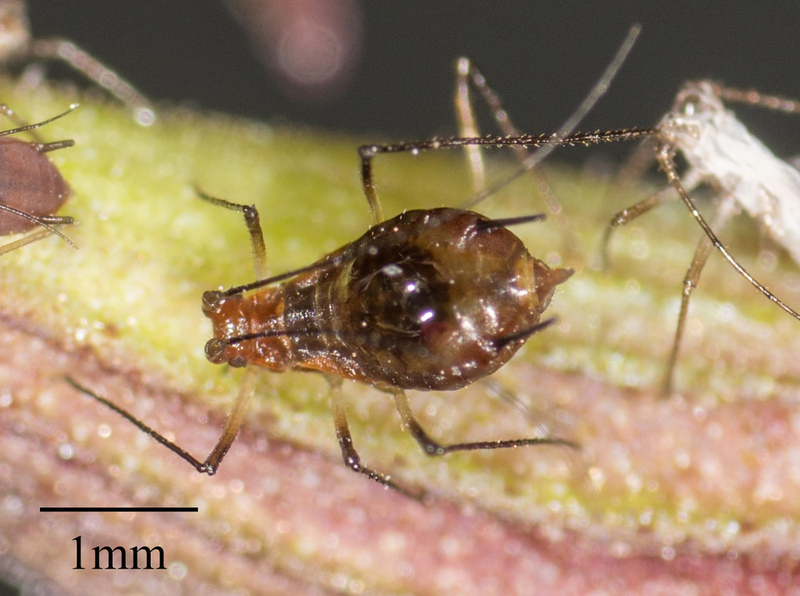 A small aphid resembling an Aphis. 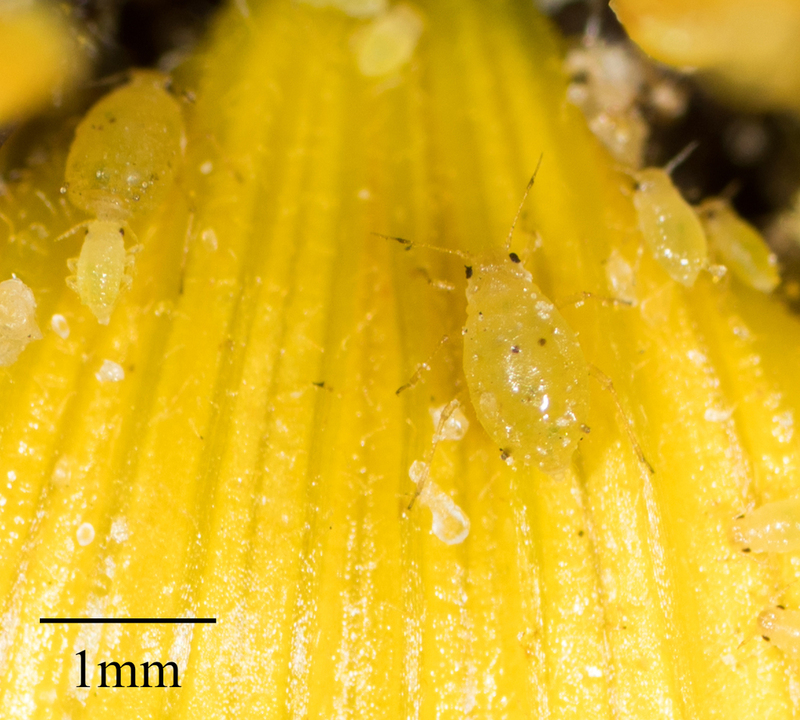 Host: Fennel and other carrot family members. 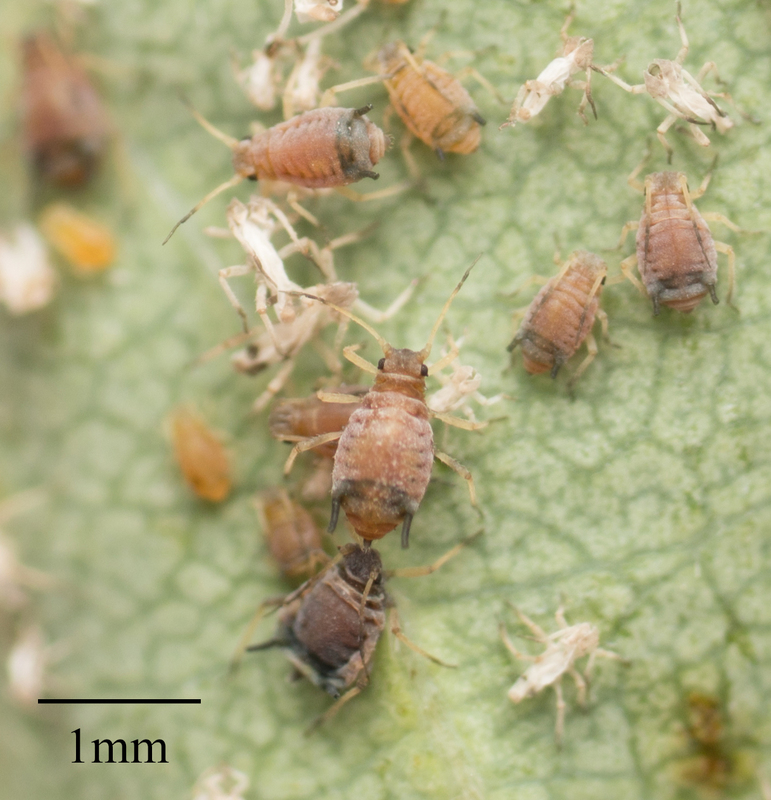 There is a very common species on pines in Southern California which sure looks like E. rileyi to me. However I have yet to be able to complete a key to identify one of these so given the complexity of the genus it may well be something else. Like Eulachnus this is another genus of aphids on pines which I need to give some more thought to. 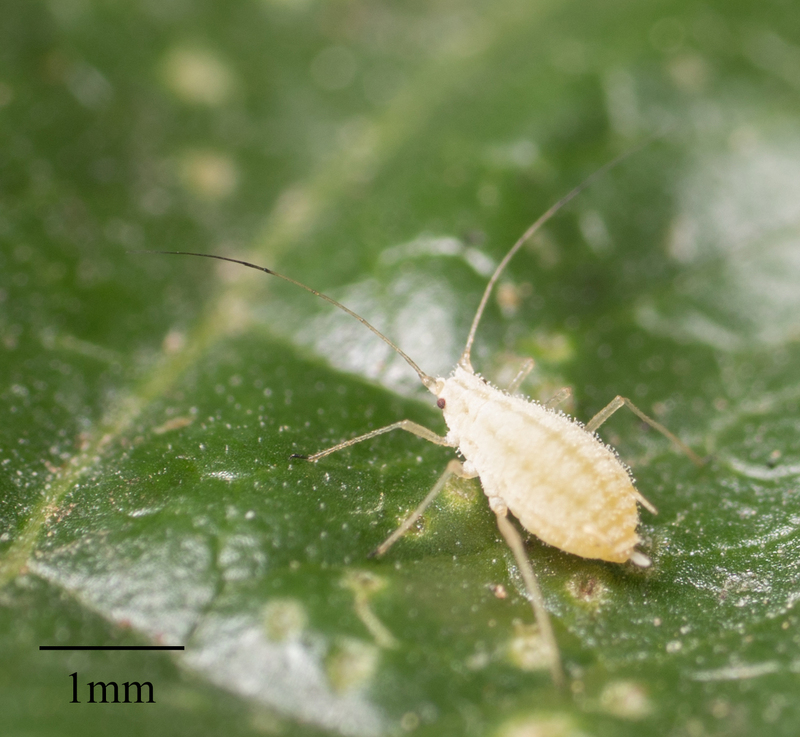 This is an oddball aphid which was relatively easily identified despite the fact I found it on a less than typical host. Hosts: I found a group of them on a California Fuschia. The hairy siphinculi on this species makes it relatively easy tell from other aphids. 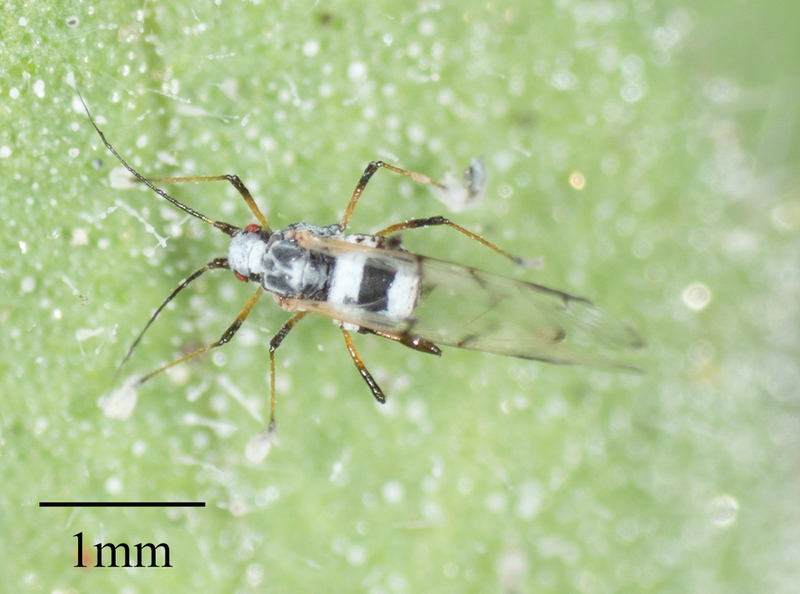 I haven't done enough research to be certain there are not others in the genus, but as best I can tell this one is correct. 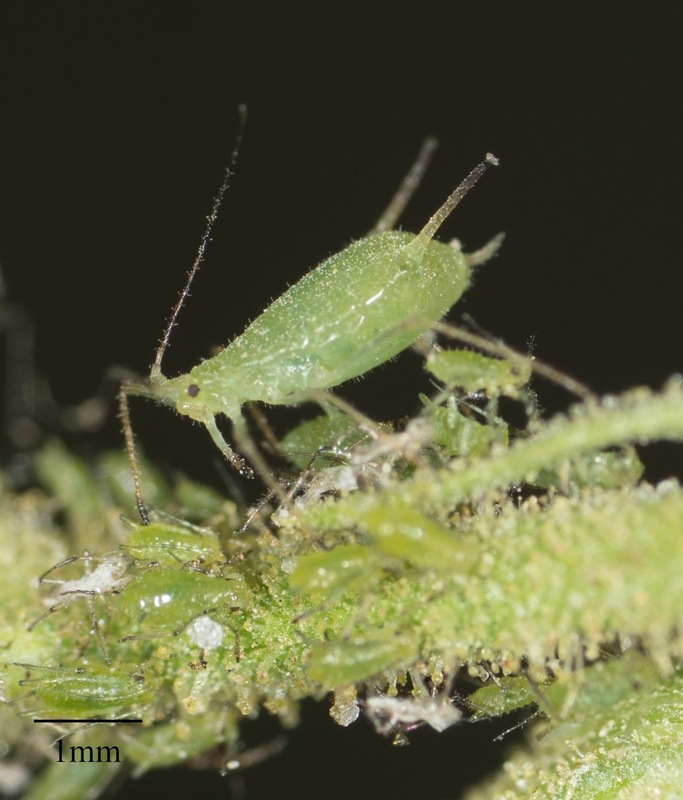 This is one of the most easily found aphids in Southern California. They are very common on sow thistle (Sonchus) plants which are a very common weed. 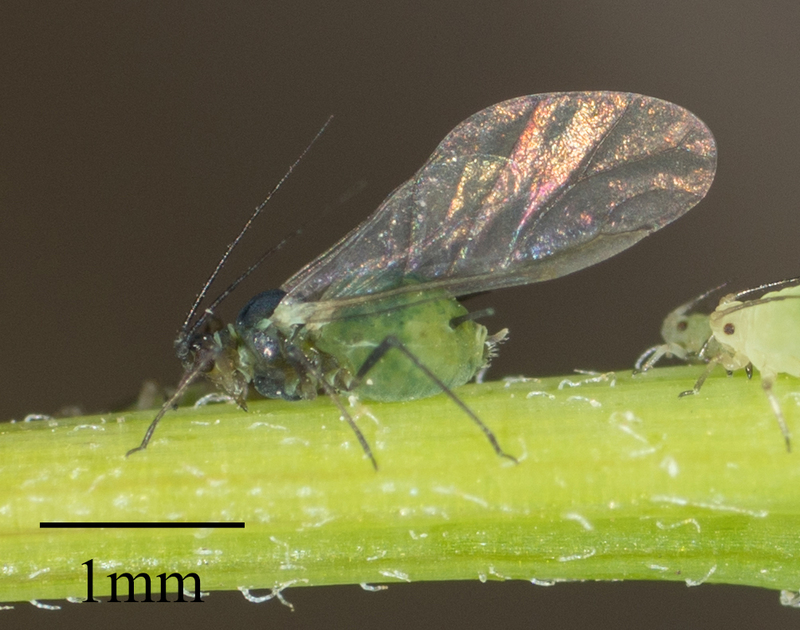 The problem is that despite being common they are pretty difficult to tell from other members of the genus. In particular Hyperomyzus carduellinus is difficult to rule out. 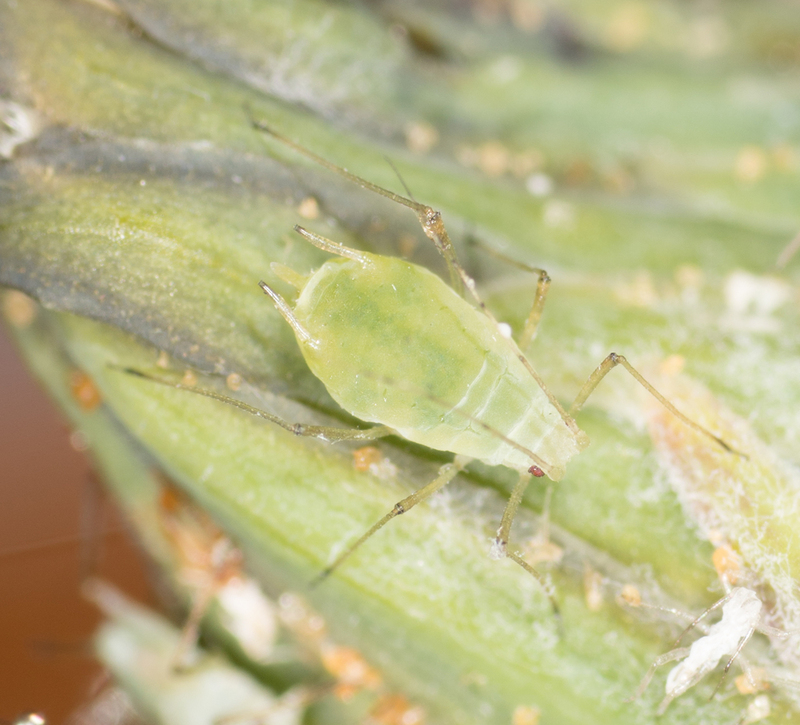 At the moment all the aphids in this genus I have investigated have been either inconclusive or Hyperomyzus lactucae though. So maybe that is the only species we have here. 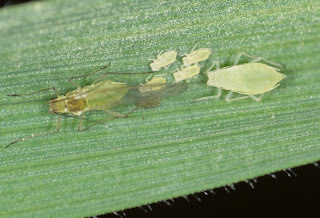 Resembling yet another black Aphis, this is one of the more common aphids on grass. The pale sections on the antenna, tibae and cauda make this surprisingly easy to identify. Not a typical aphid of California but I found some on a Tulip Tree in a park. 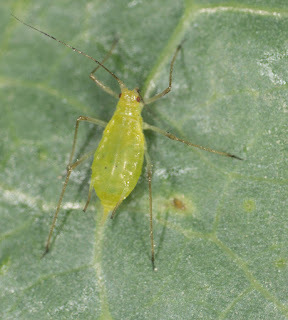 A common aphid on many mustard plants, often hiding among flowers. 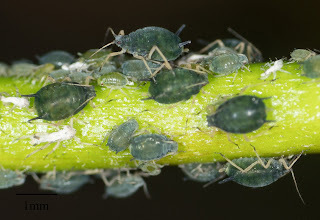 Somewhat resembles cabbage aphids but has less wax. 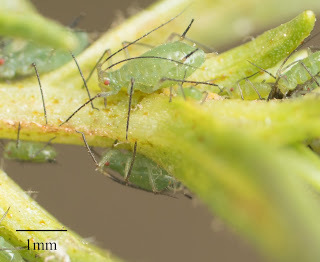 A difficult to identify inhabitant of Artemisia plants. Hosts: I have found them on California mugwort (Artemisia douglasiana), they should be present on other members of the genus. 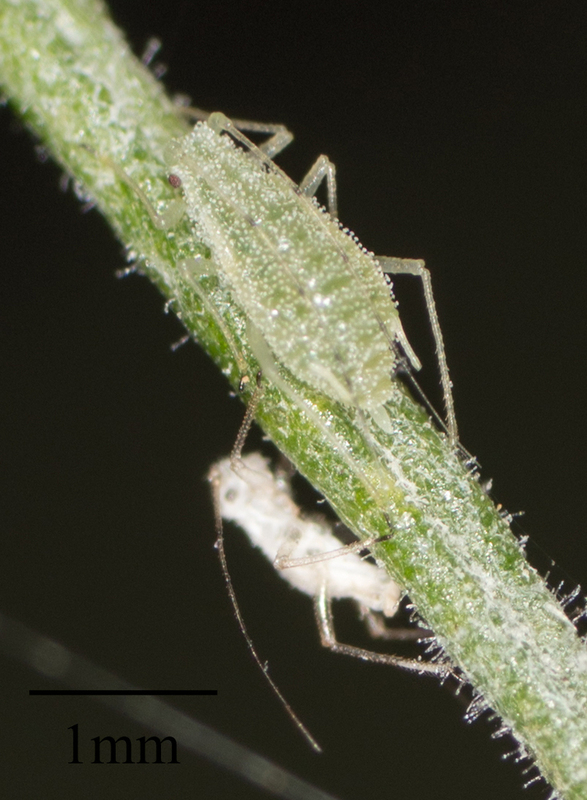 Another difficult to identify inhabitant of Artemisia plants. 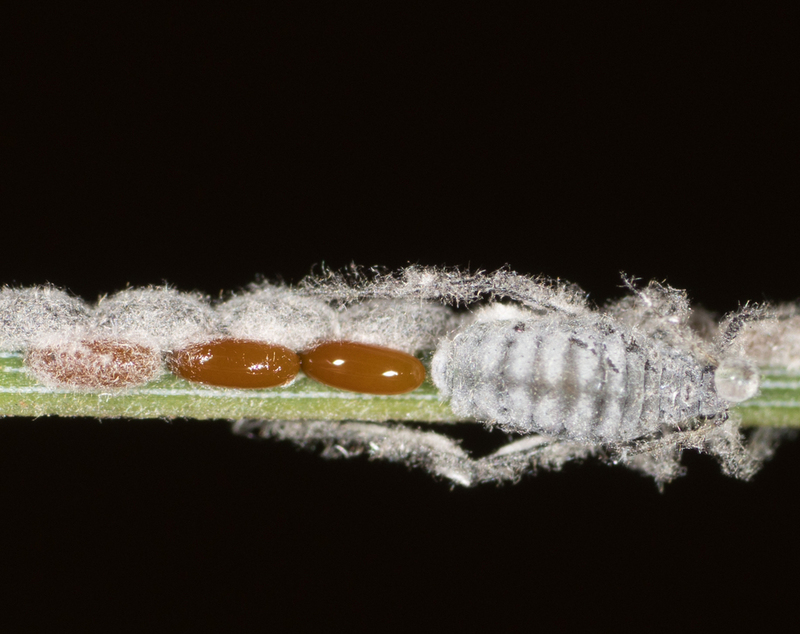 Hosts: I have found them on taragon (Artemisia dracunculus), they should be present on other members of the genus. 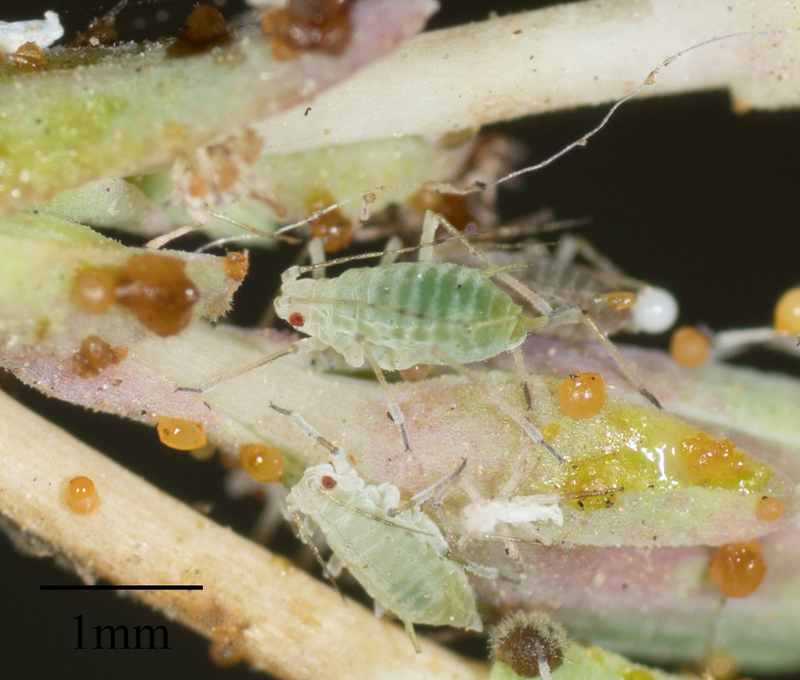 Unusual for willow aphids that there do not appear to be a ton of look-alikes(or if there are they are currently undescribed)so it is relatively easily identified. 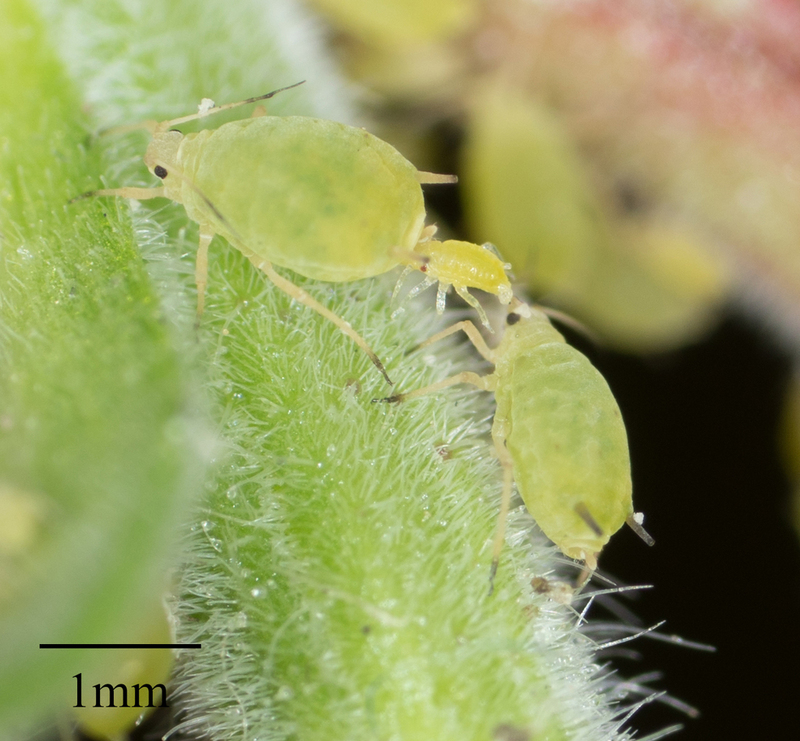 If you search for Aphids in Southern California you quickly get tired of seeing yet another potato aphid. They inhabit a great many plants in huge numbers. 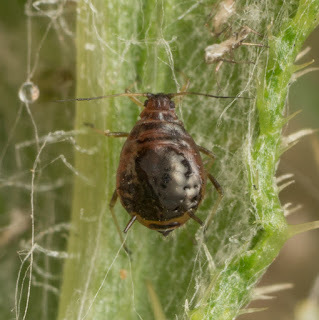 Hosts: I have found them on roses, prickly lettuce (lactuca serriola) sow thistles (sonchus), fleabanes (erigeron), orange bush monkeyflowers (mimulus aurantiacus), and white sage (Salvia apiana). Which pretty much means they eat anything. 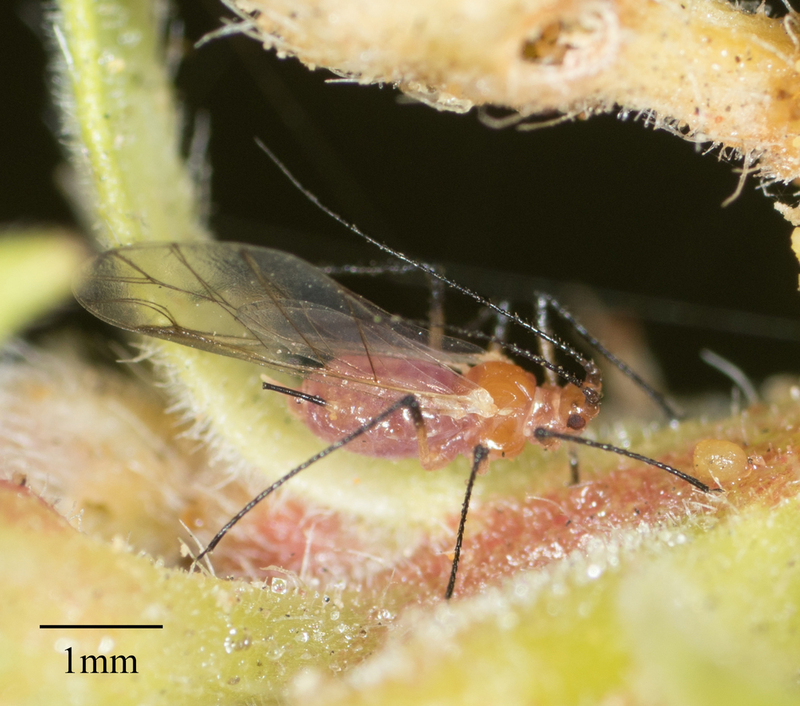 A large aphid on primroses. 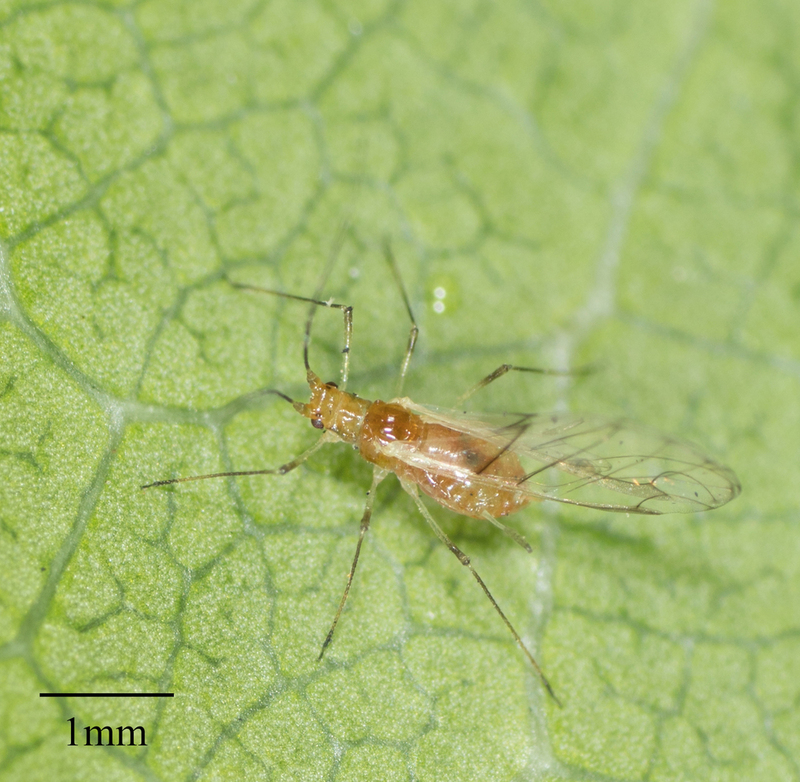 Can be separated from M. euphorbiae by the additional dark on the siphinculi. 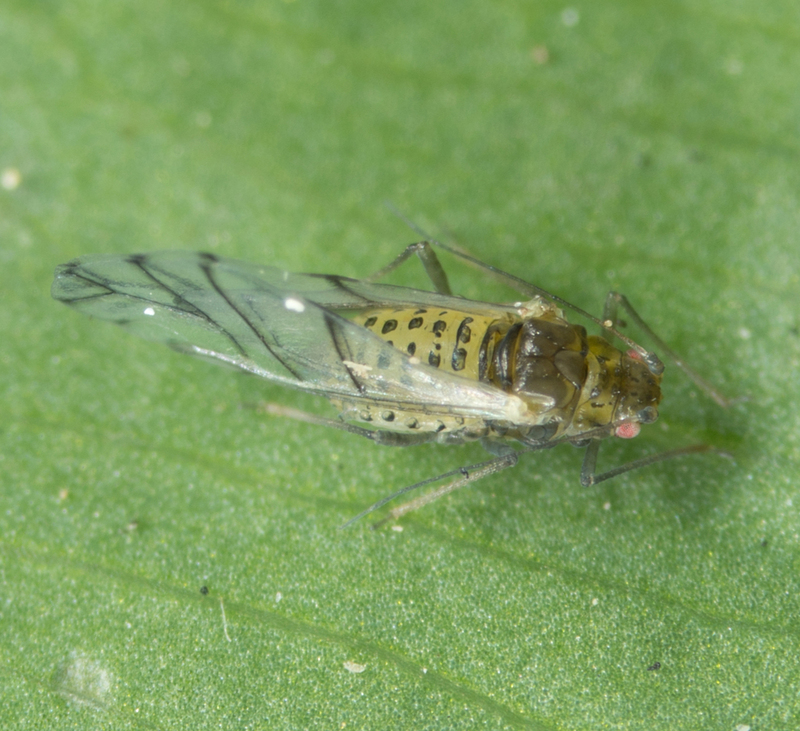 Hosts: I found it on Oenothera elata, it should be present on other primroses. 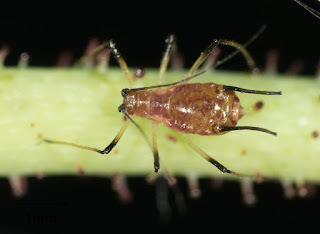 One of the more common aphids, lots of look-alikes but I belive these can be identified due to the long dark siphunculi. 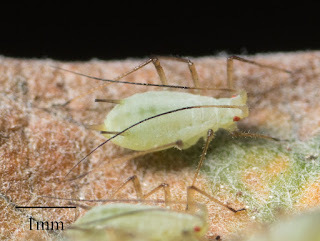 As far as I can tell I am the only one to have reported this aphid in California. 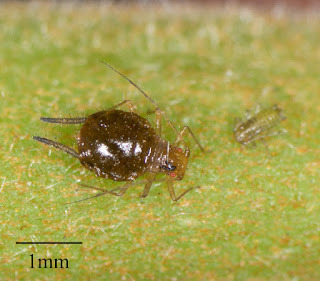 The large dark patch on the back may be distinctive. 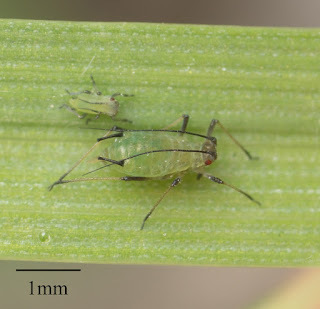 A common and easily identified aphid on giant reeds. 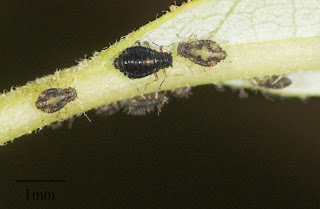 I will have to learn to pay attention to potato aphids on roses to make sure I don't confuse this one. 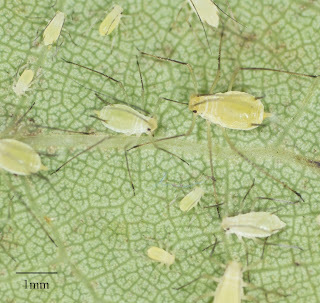 They appear to typically be lighter colored than potato aphids. Hosts: I have seen rose grain aphids on grasses. 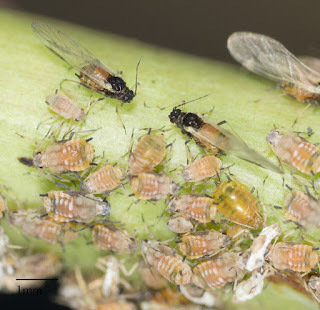 Presumably they also can be found on roses. 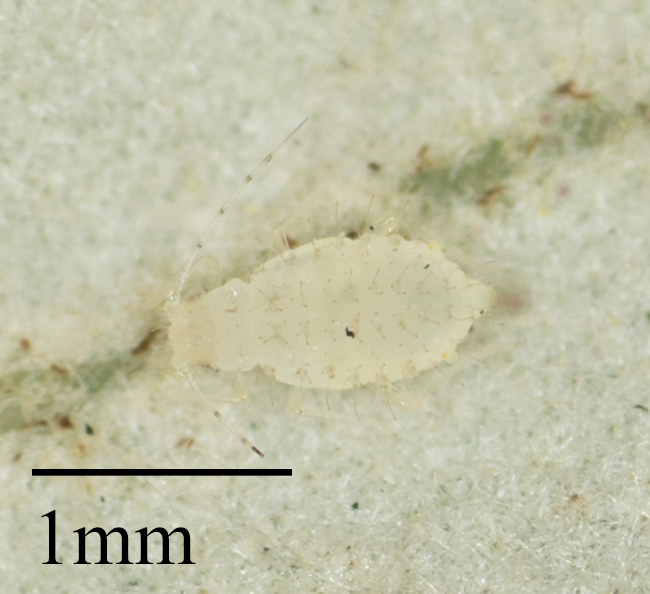 Relatively found on white fir plants because of the curling of newly grown in leaves they cause. They proved to be very difficult to get to species. 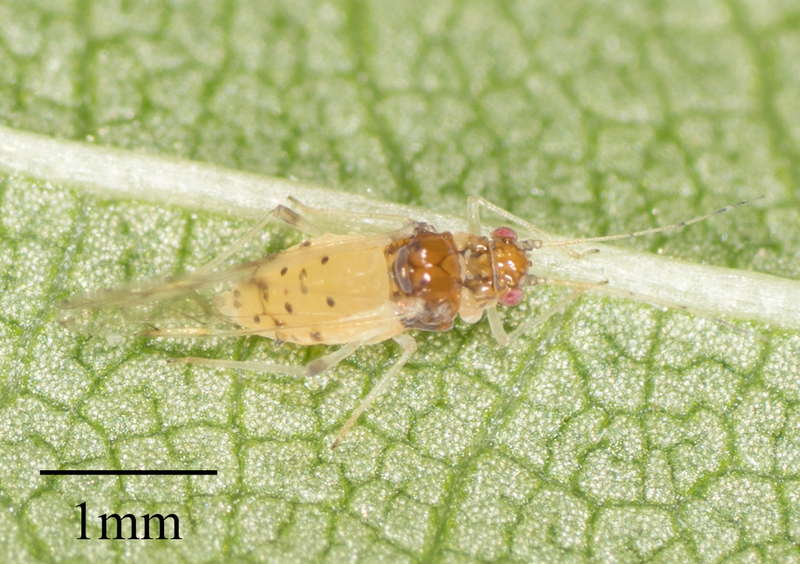 As best I can tell, this species was apparently previously unreported in California. That means it is pretty likely I misidentified it. 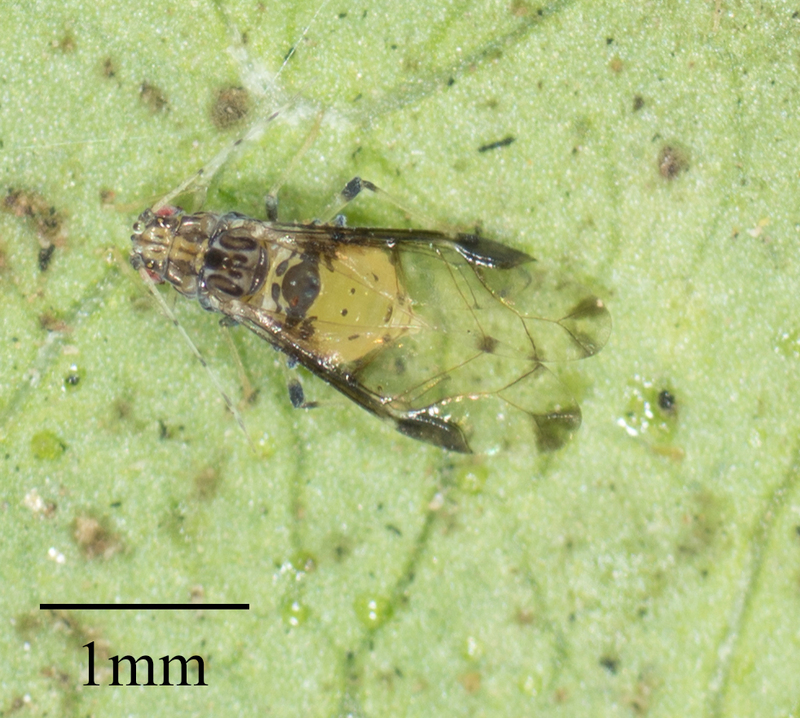 It did seem to key out to this species though. 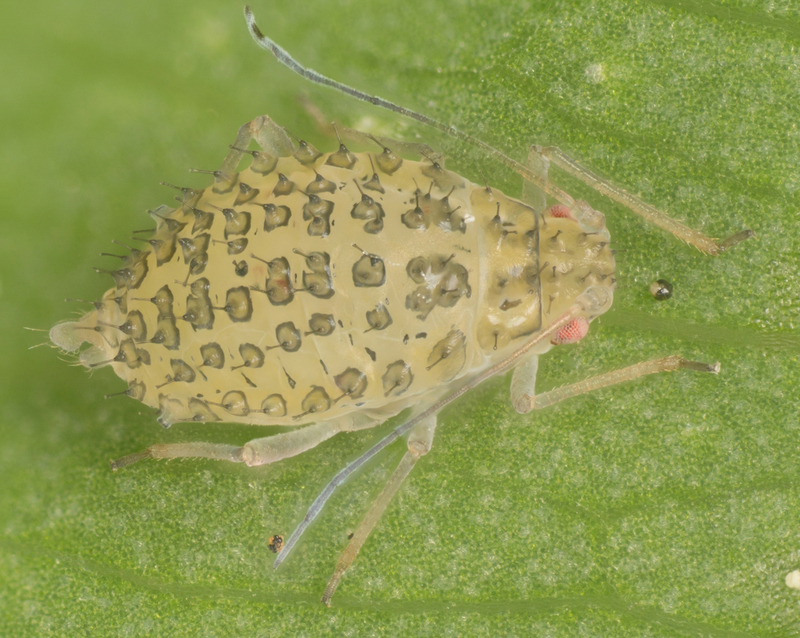 One of the more brightly colored aphids. Supposedly there are some look-alikes but I haven't really researched the genus. 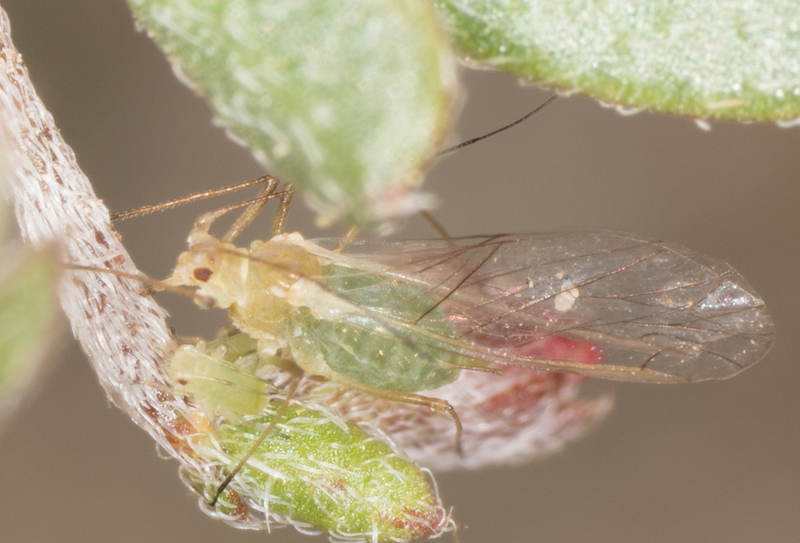 A drab aphid which proved incredibly difficult to get to species. I may try again once I finish some microscope upgrades. Green peach aphids, another weedy aphid present on a wide variety of hosts. 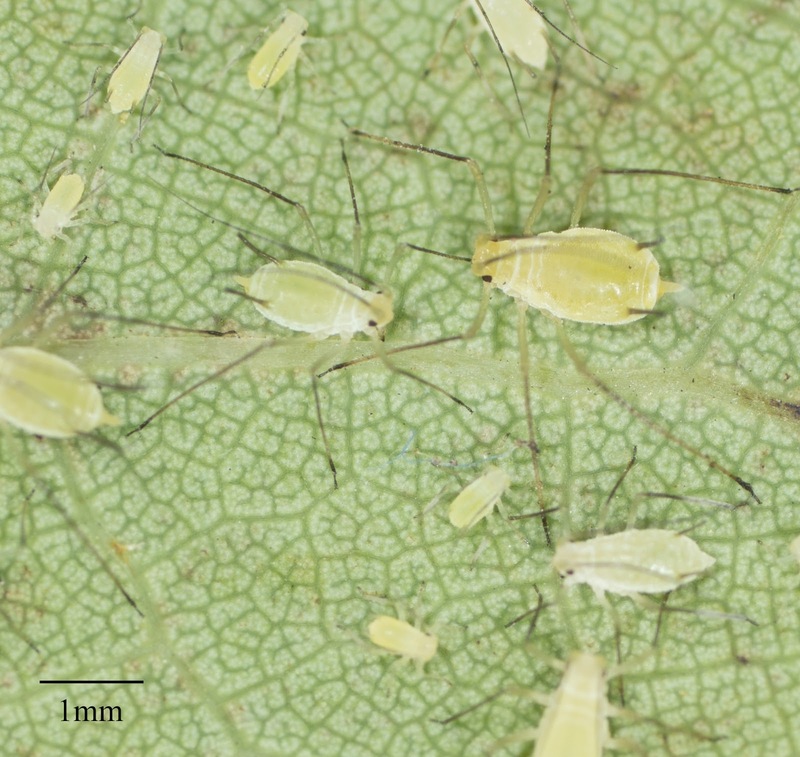 Hosts: I most often find these on the leaves of mustard plants. 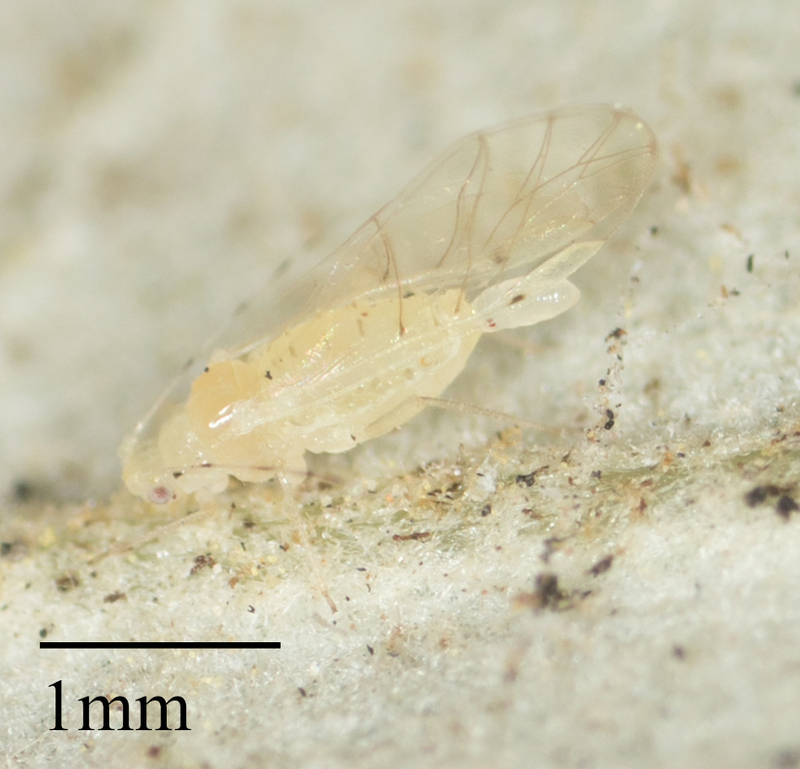 I have also found on Vinca major. 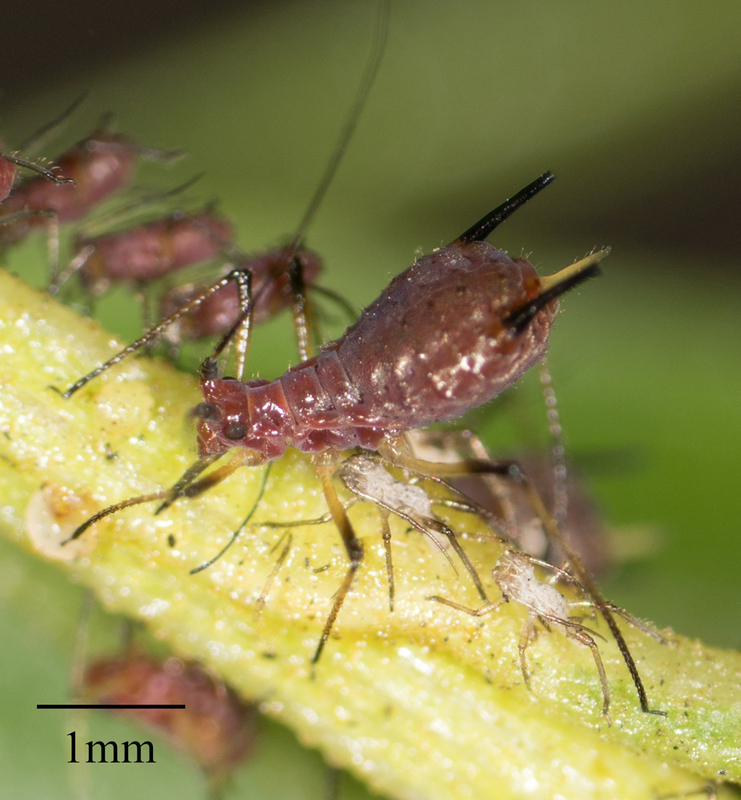 Before doing this I failed entirely to grasp the transient nature of aphids. When I found this species in August they were ridiculously common. Then they disappeared within a few weeks of my seeing them and I have not seen them again. 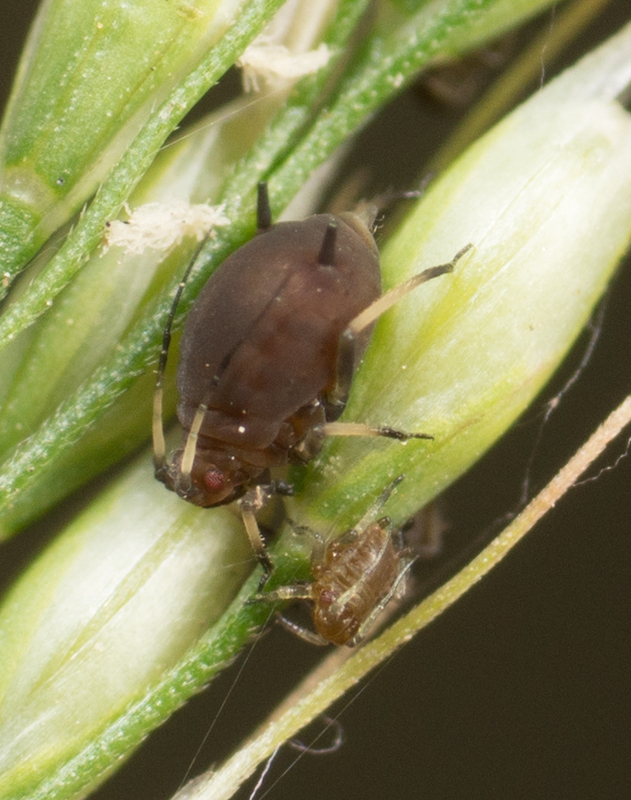 I came to the conclusion this is N. paucisetosus, or it seemed to key out correctly but any time a species is previously unphotographed it is hard. 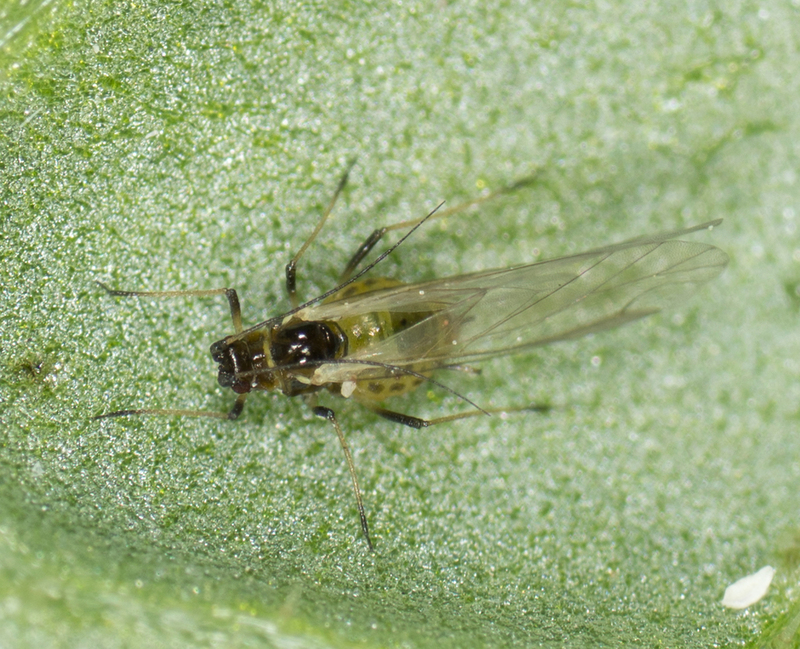 Late the last few winters a plague of these descended on my onions. They seem to disappear by late spring. 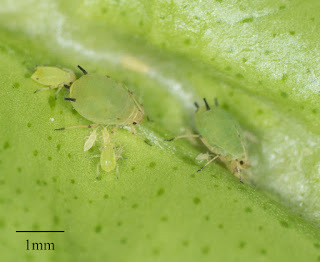 Now that I know a bit more about aphids I will have to track down this genus and try again to identify to species. Thus far I have failed to identify one though. 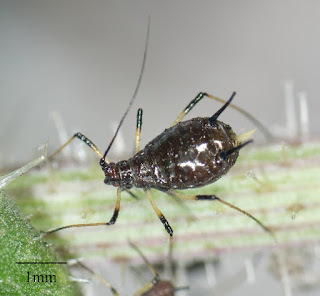 A hairy white aphid which I suspect is rather common and easily identified on California mugwort. 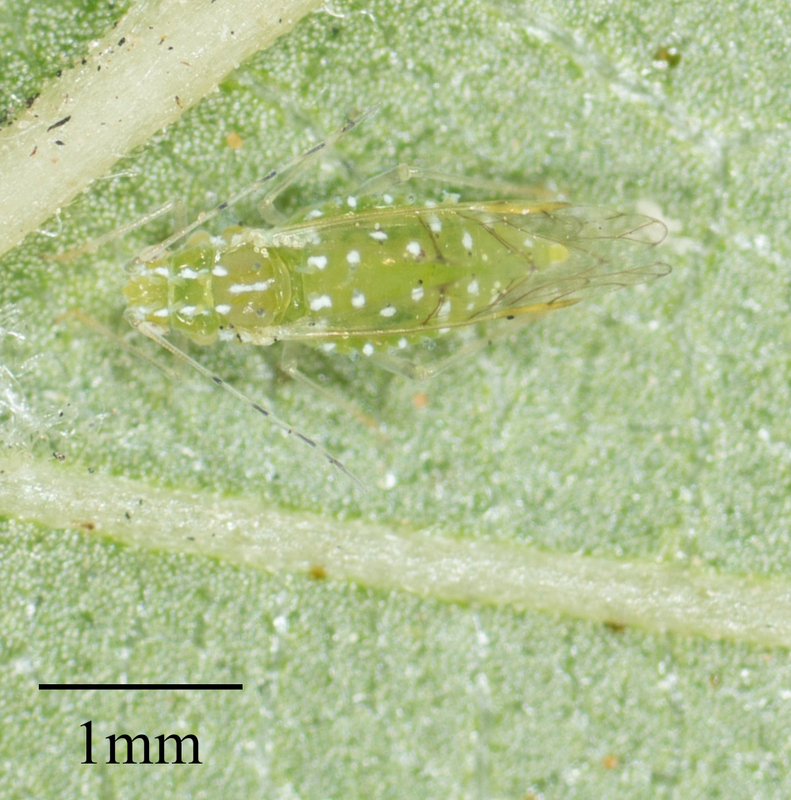 A well camouflaged species which can be found on Goldenbush plants. 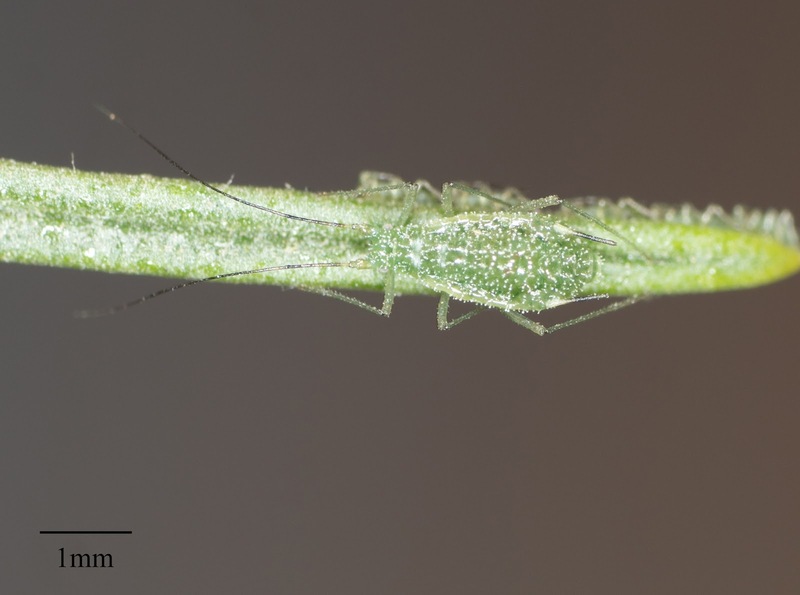 Another species of green Pleotrichophorus which are somewhat difficult to identify. 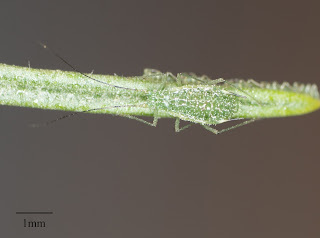 A small aphid resembling a chaitophorous species. Sometimes it is present in large numbers on alders in canyons. I found it on an alder in a park. The dark spots on the legs make it straight forward to identify. 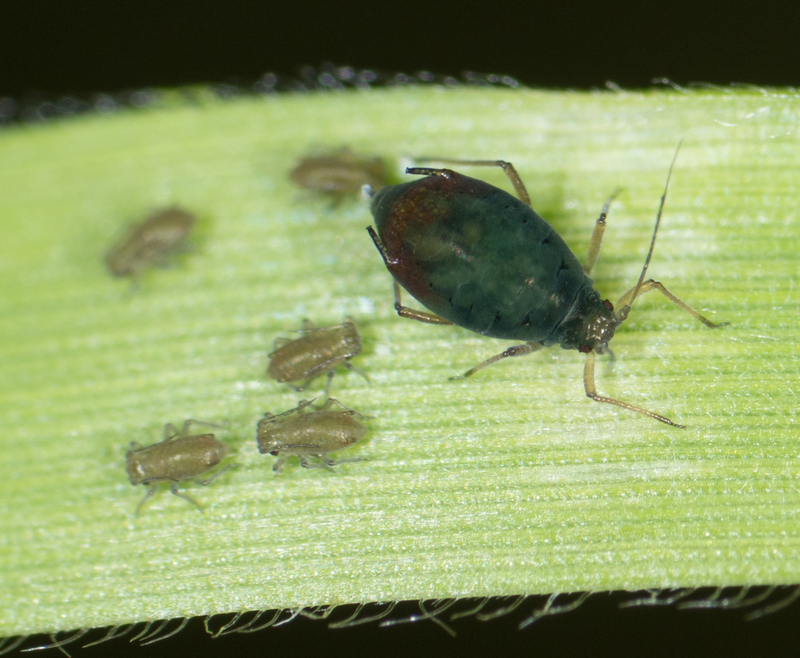 I found some grass aphids and completely failed to key them out. Looking at pictures of R. maidis it seems like they must be R. maidis though. Hosts: I found it on a grass in the genus Phalaris, but it should be on many other types of grass. 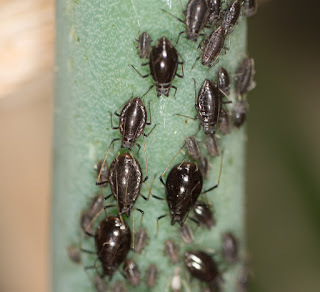 Often I find aphids after I get home. 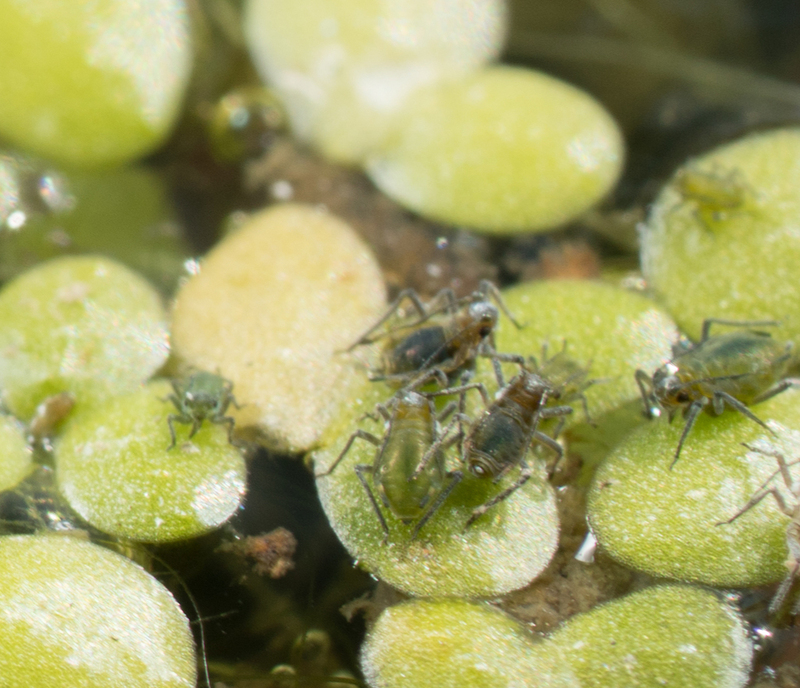 This aphid hiding on duckweed was one of them. A shame I didn't see it in the field or I would have got better photos. As far as I can tell this is one of the more common and easily identified of aphids on grass. The rust color around the siphunculi stands out a lot. 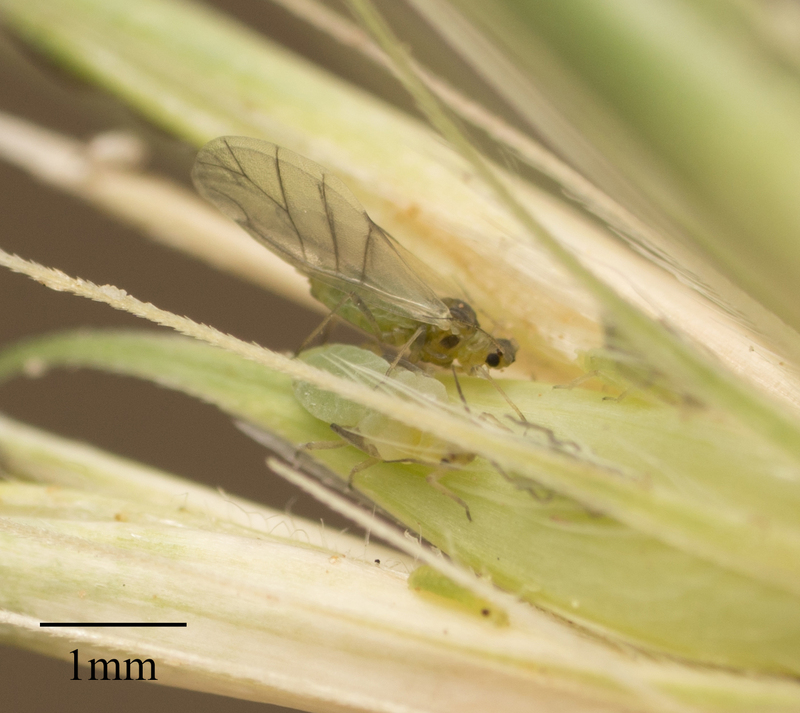 Hosts: Grasses and similar monocots. Hordeum murinum and Iris are two examples. 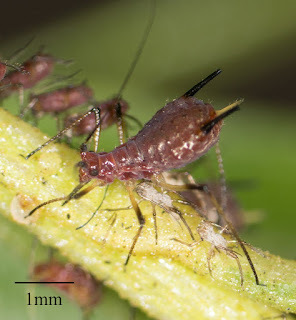 In the running for the hardest aphid name to say. Luckily it is about the easiest aphid to find and identify. Find a crape-myrtle tree. This isn't hard, you probably see a hundred trees a day as they are such commonly planted street trees. 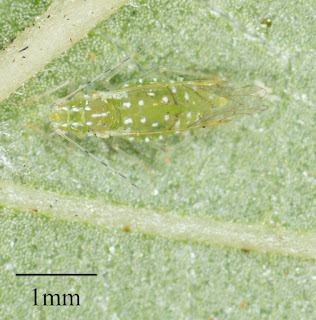 Look under a couple of leaves. There, you found it. Did I mention pine aphids were hard? 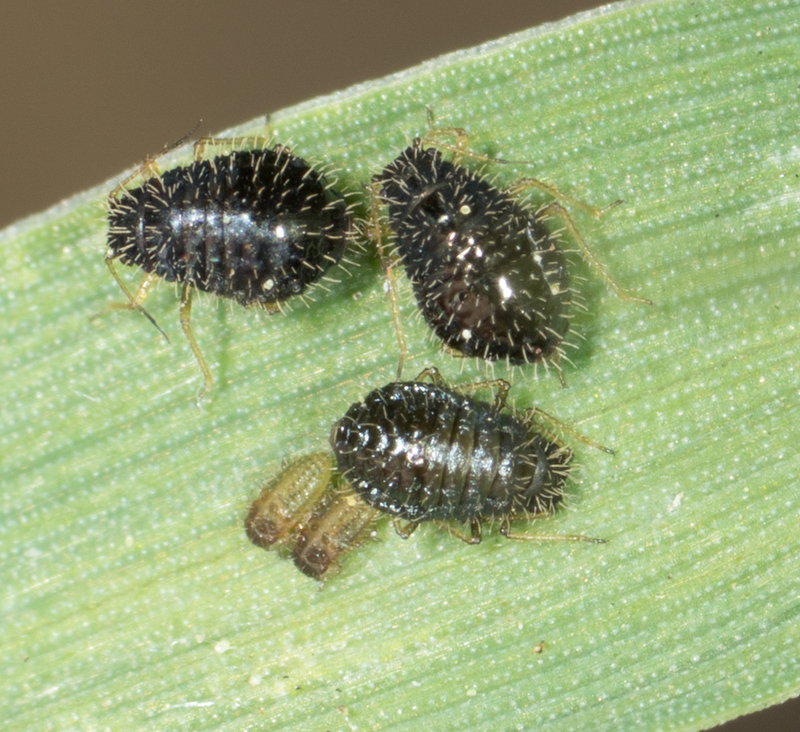 Much less common than Sipha maydis, but also occassionally found on grasses. A recent introduction to Southern California which is now one of the most common aphids on grasses.As it is so common on many of the most invasive grasses this one may actually be having a real ecological impact. 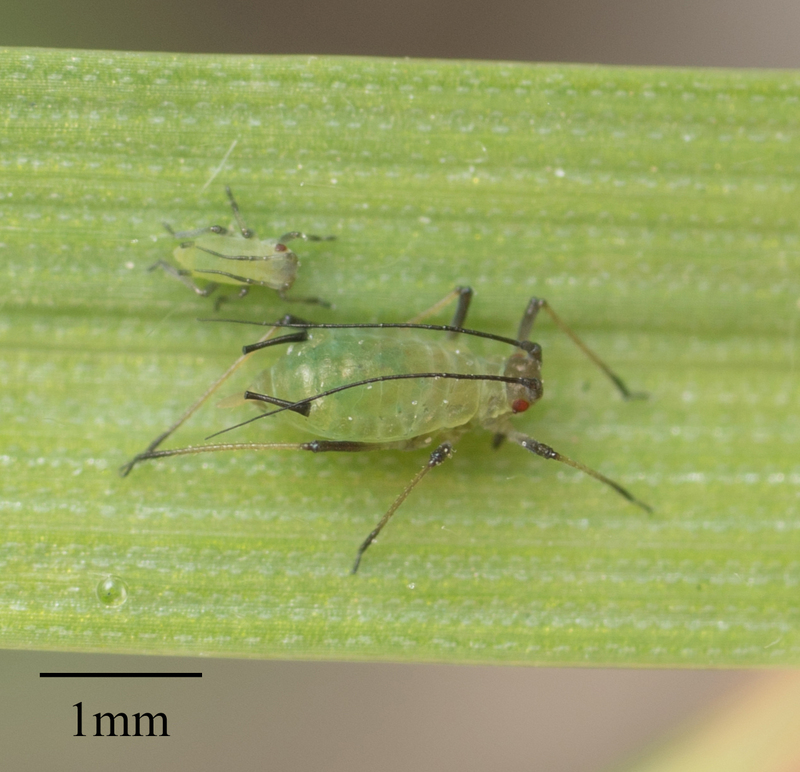 There are two common dark green aphids on grasses. This one can be separated from S. fragariae because of the long cauda. 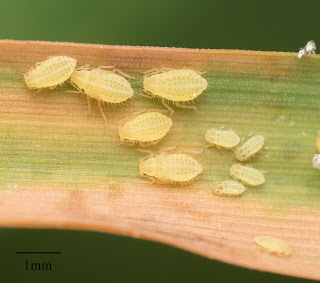 Hosts: I have found on Avena fatua should be present on other grasses. 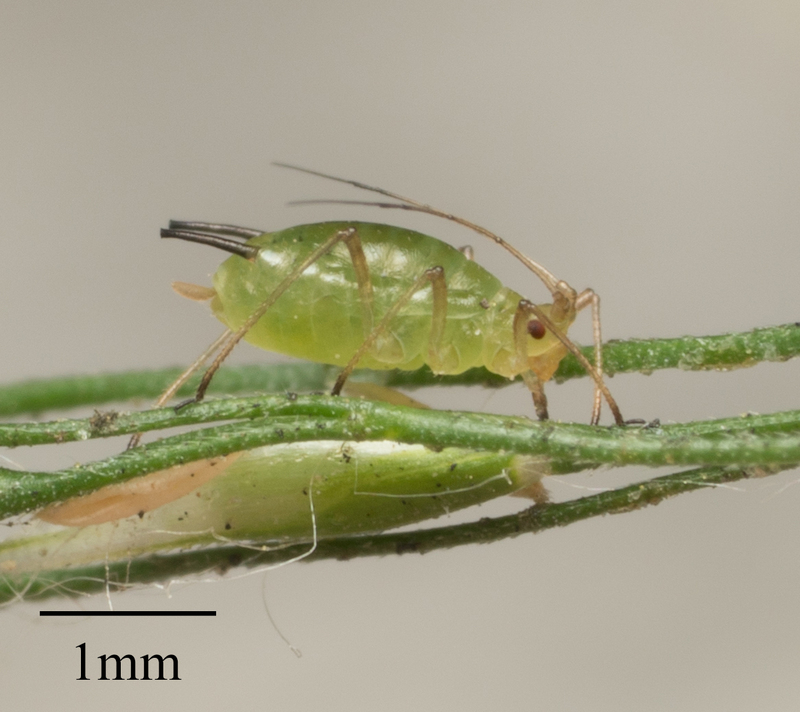 Another generic green aphid. 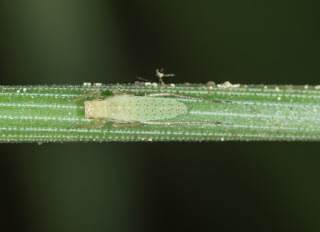 Commonly found hiding among grass seeds. Can be separated from S. avenae because of the short cauda compared to the siphunculi. 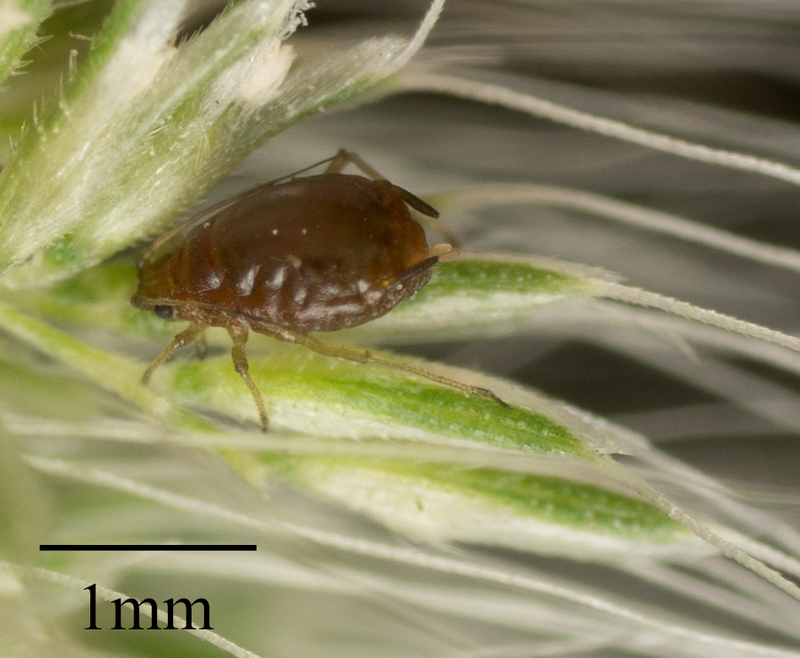 Hosts: I have found on Hordeum murinum should be present on other grasses. This aphid can be commonly found on live oak trees by looking for either white fluff on the leaves or folded up leaves. 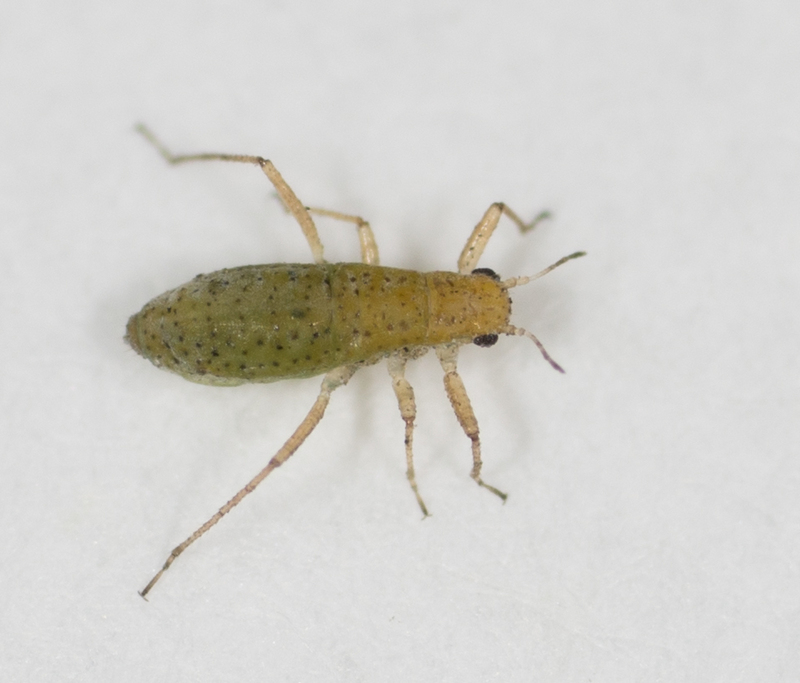 I haven't been able to solidly confirm species, but it is probably S. essigi. 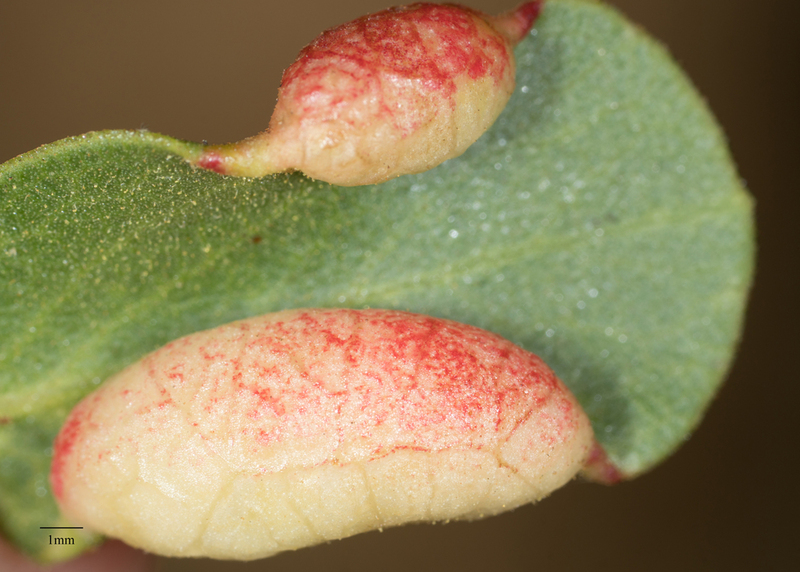 These are what make the red galls on Manzanita plants. 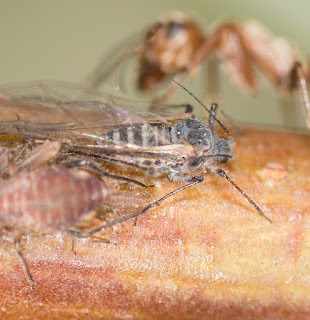 Almost all the Tamalia on iNaturalist are marked as Tamalia coweni. 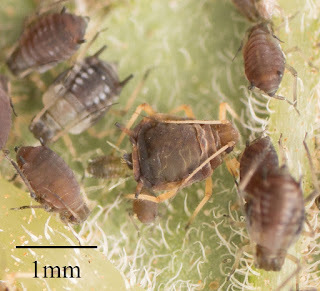 In parts of the state this might be accurate, but I suspect many are other members of the genus in many of those galls. If you find these, try to get a picture of the actual aphid, not just the gall. These have been present in my back yard for some time. 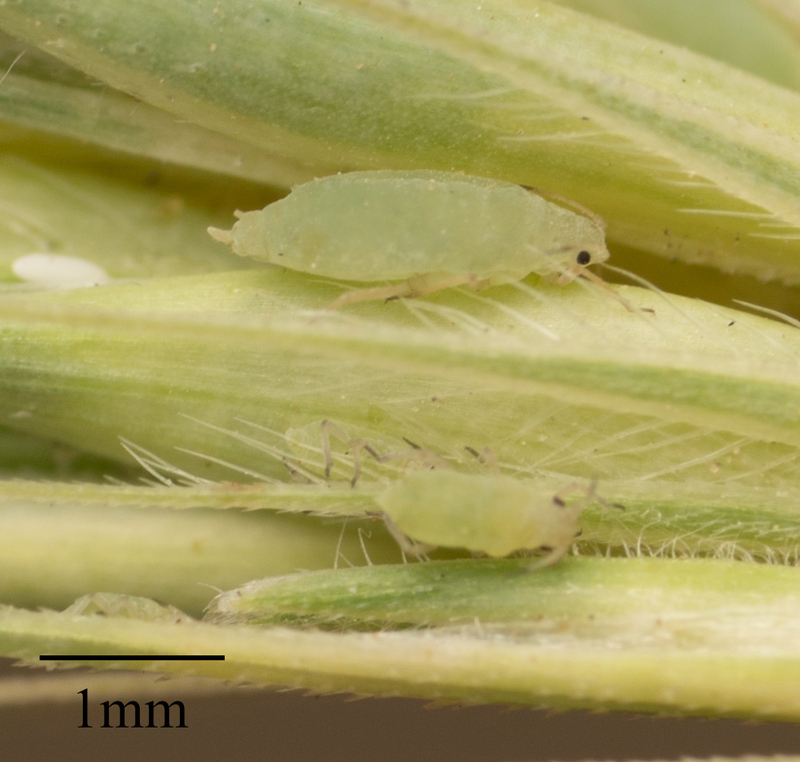 They hide under clover leaves. 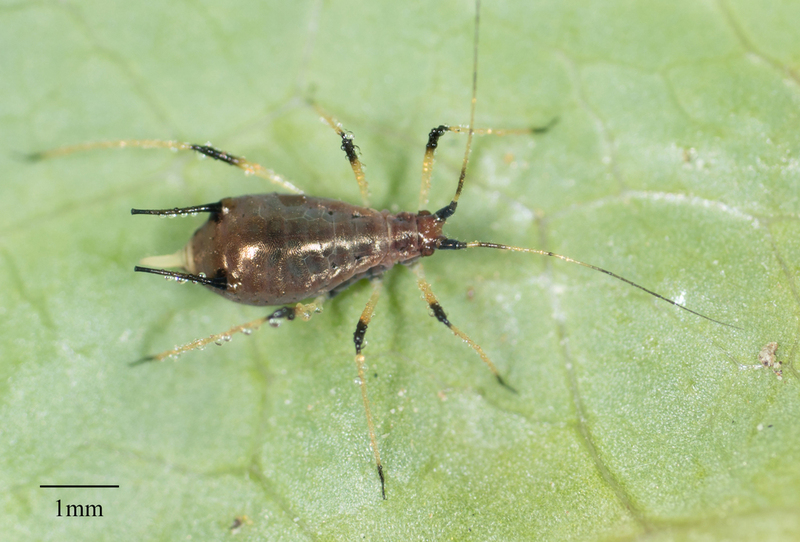 Despite a lot of looking I have yet to see any on clover plants not in my yard. 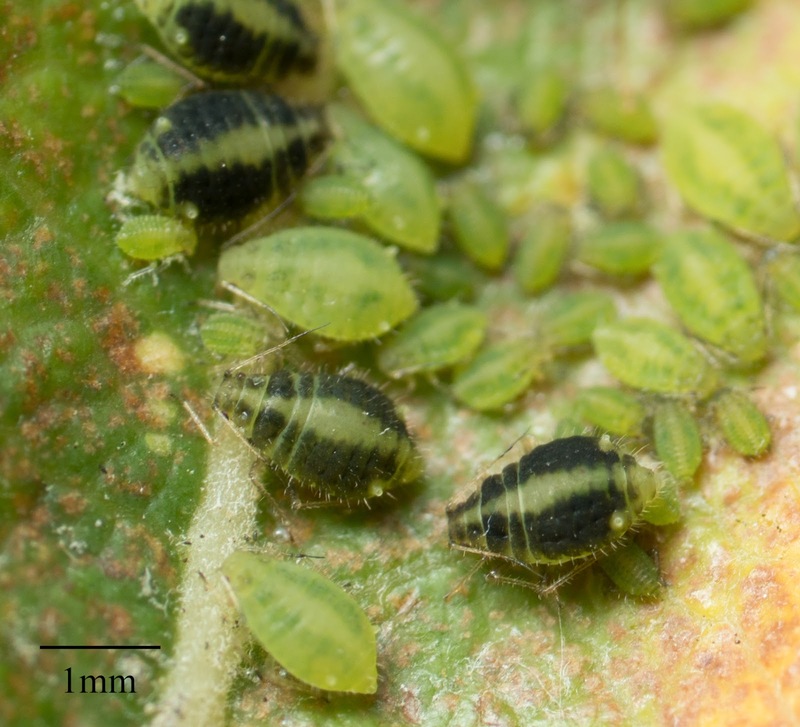 Hosts: Siberian elm, Ulmus pumila. 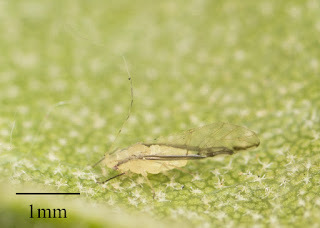 This is a common aphid in urban areas. It only has a winged form. 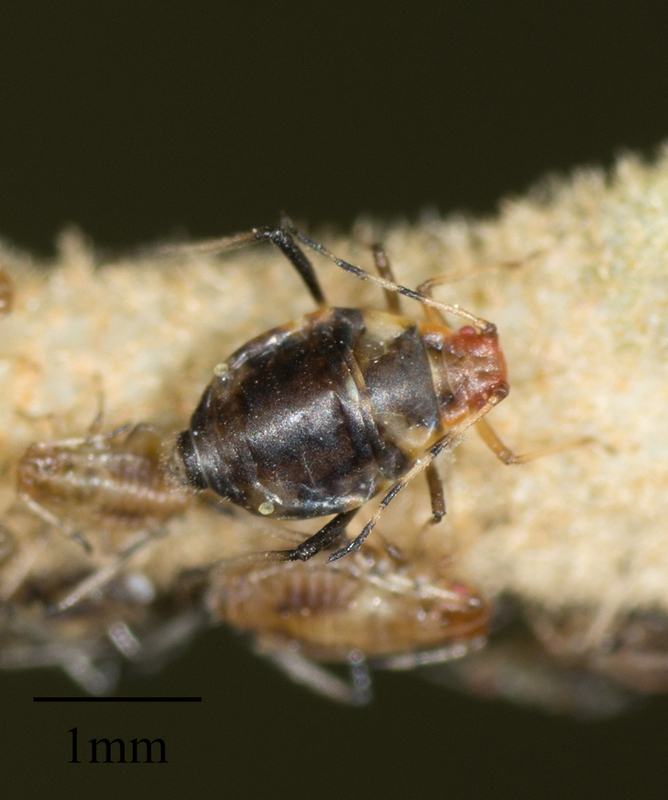 I believe the bumps and markings on its head and thorax make it T. ulmiparvifoliae but I don't know the genus well. Hosts: Elms. The type you usually find in parks in Southern California. 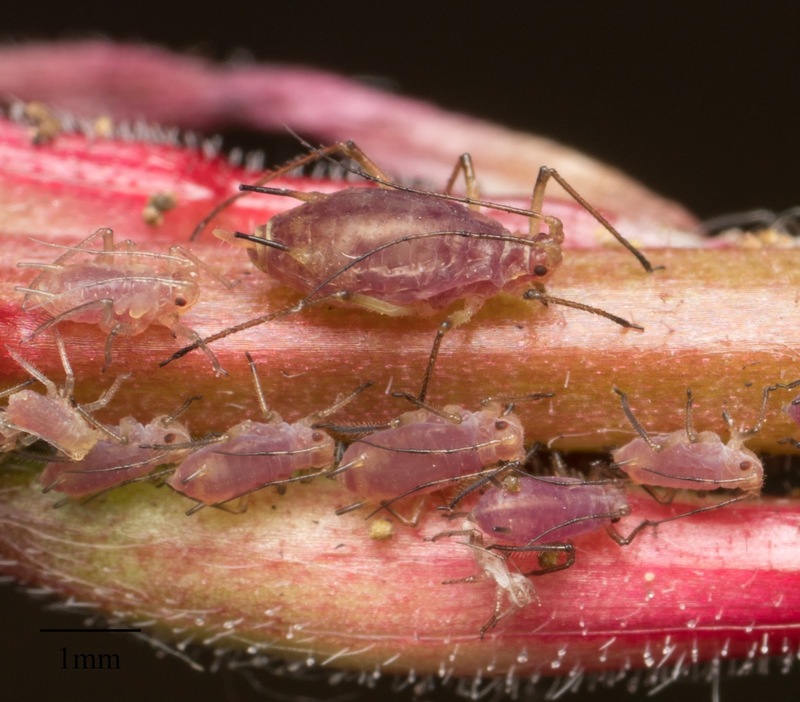 One of the red aphids that can be found on top of mule fat plants. 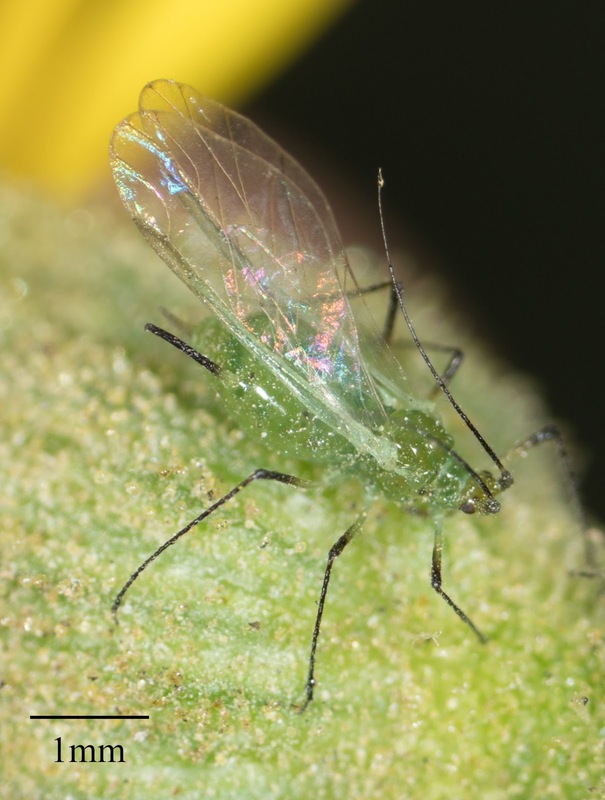 Apparently there is some controversy as to whether this species actually inhabits plants other than ragweed, but it sure seemed to key out to this. 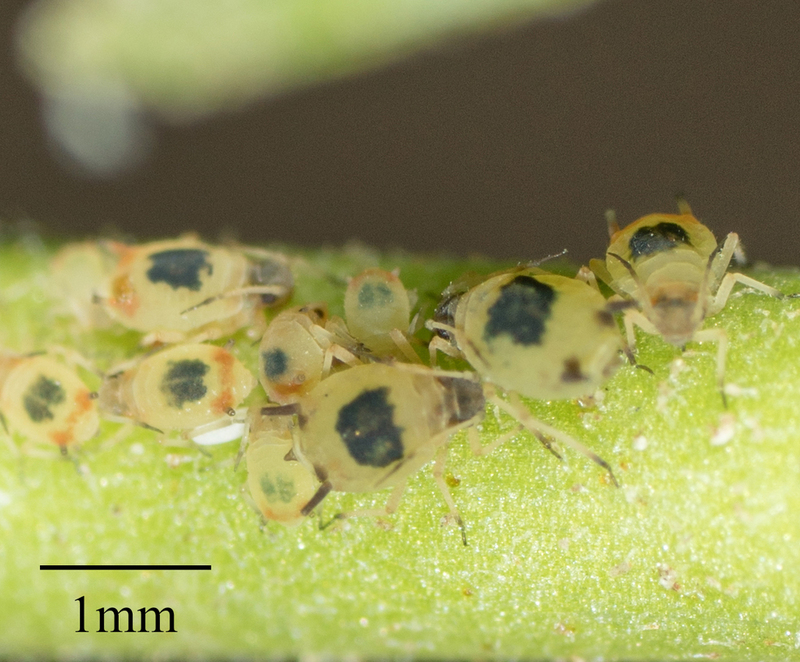 Looking suspiciously like potato aphids, these are supposed to be common on plants of the sunflower family. 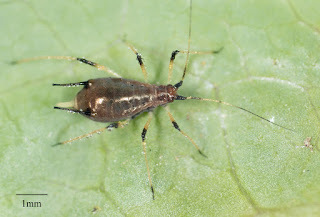 Apparently both U. picridis and U. sonchi live on bristly ox tongue. 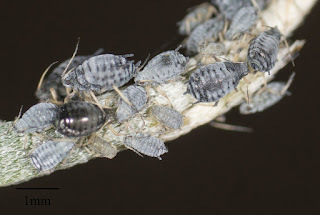 Every time I find them though they seem to key out to U. picridis. There are supposed to be a great many Uroleucon species present on sow thistle. I often think I found a new one of them. Thus far every single one has been U. sonchi on closer examination. 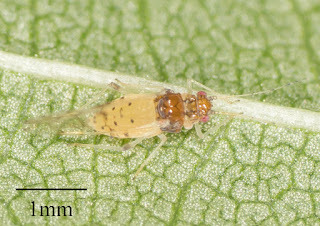 This species was very common northwest of Palm Springs on Brittlebush plants. 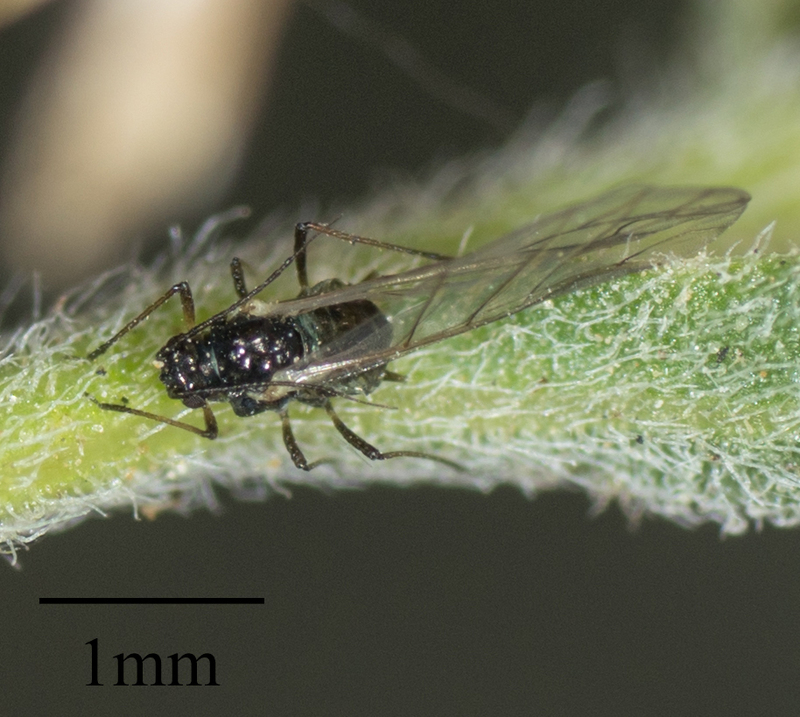 At the time I was not up to the task of identifying it beyond genus but I will have to try again next spring. These have been on the tree in my front yard for a couple years now. They seem to come in waves where sometimes I can hardly find them and other times they are everywhere. Somewhat unusual in having two color forms. 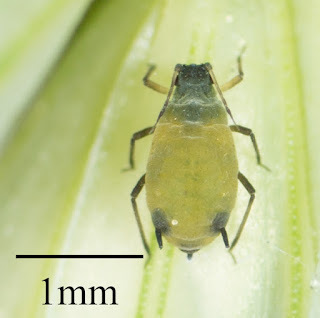 Apparently species are poorly understood in this genus so the identification is somewhat tenuous. 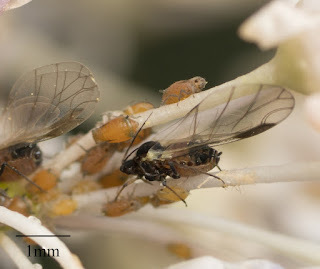 Very common on Arbutus trees and can occasionally be found on roses.